Half day hit on the North West face of Pointe de la Sana today (20/03/18). 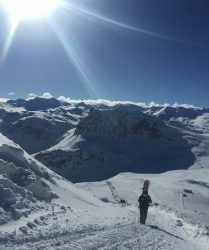 We left Tignes at 11:00, but lift closures meant that we didn’t get out of Tignes before 12:00ish! 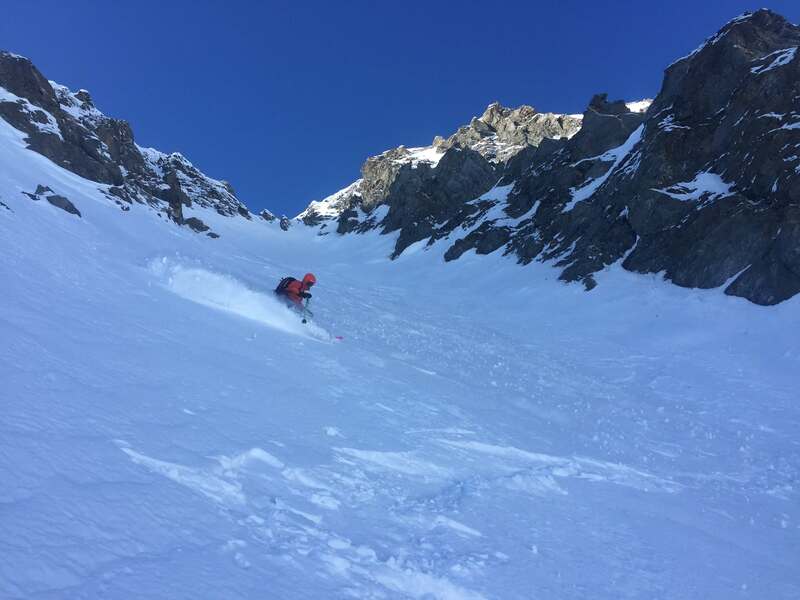 I always seem to get this couloir in amazing powder and today was no exception, with dry, light powder all the way down the couloir. 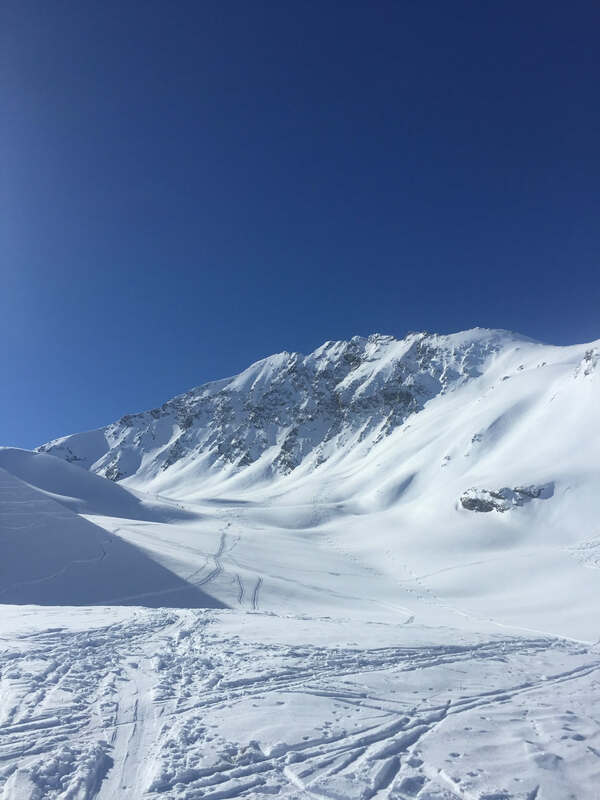 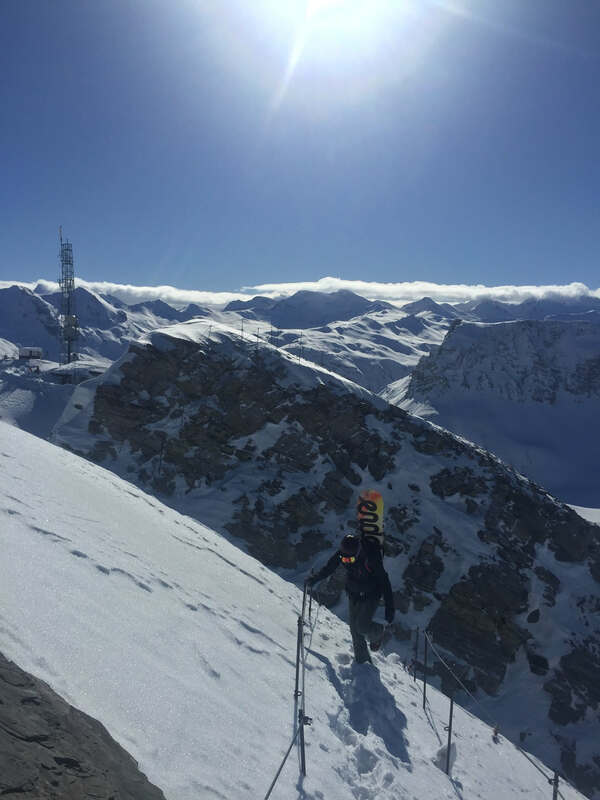 Weather conditions were much better than forecast (particularly up high) so we headed straight for the North Face of the Grande Motte and smashed out some fast laps in perfect powder. 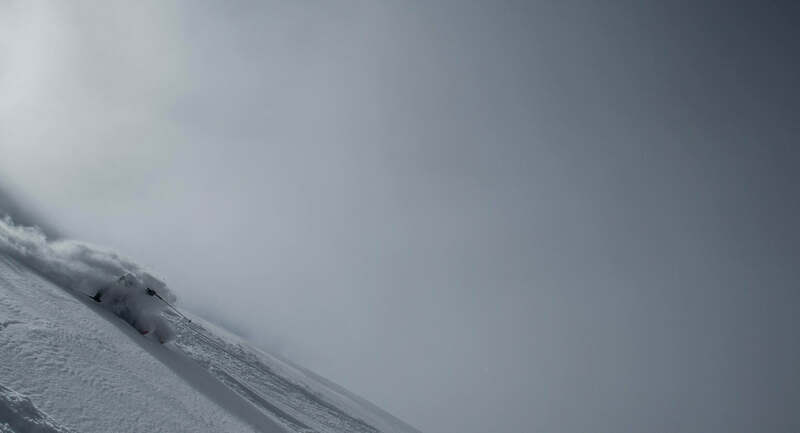 Cloud was coming and going, but we were usually above the cloud line. 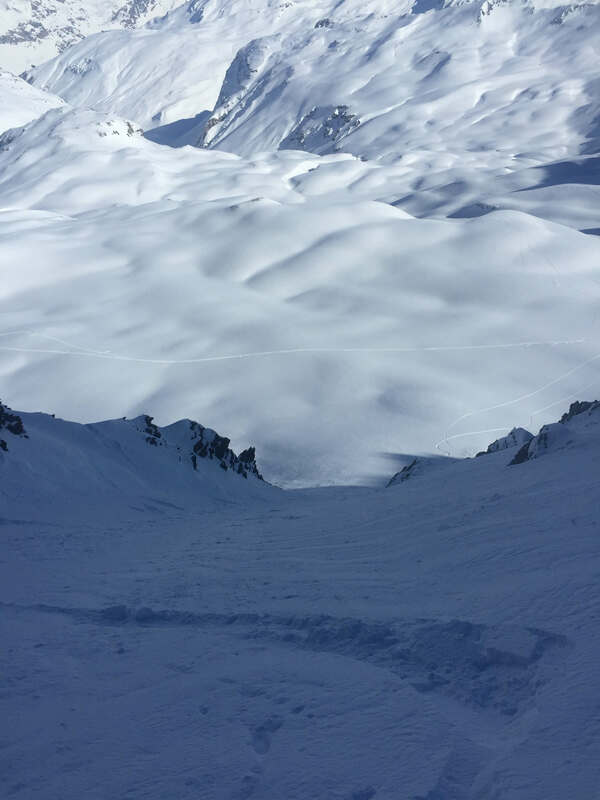 There are still some fairly large holes on the glacier, so keep an eye out! 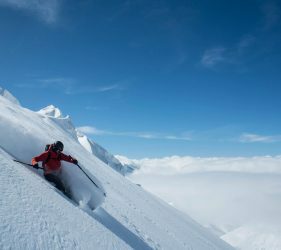 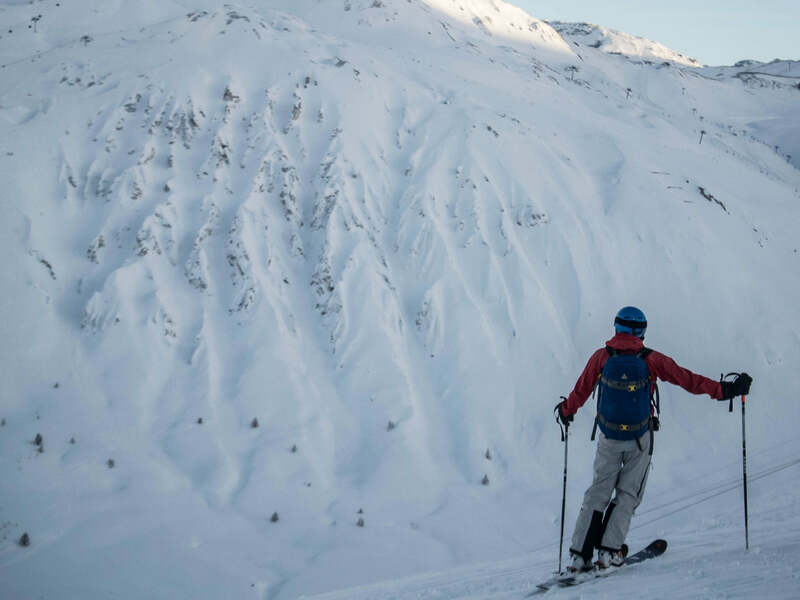 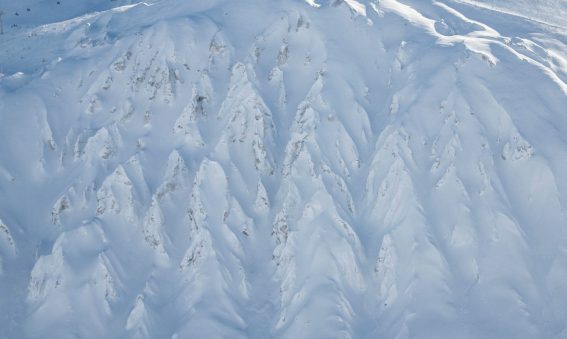 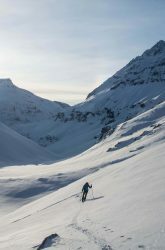 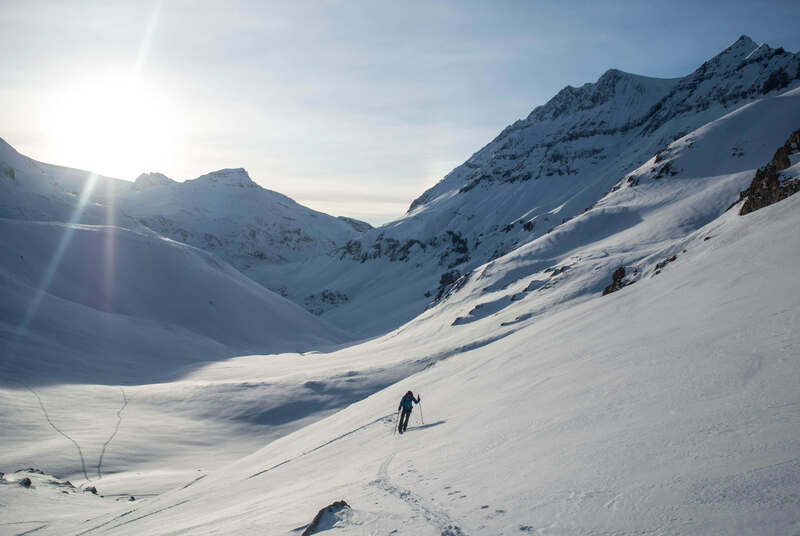 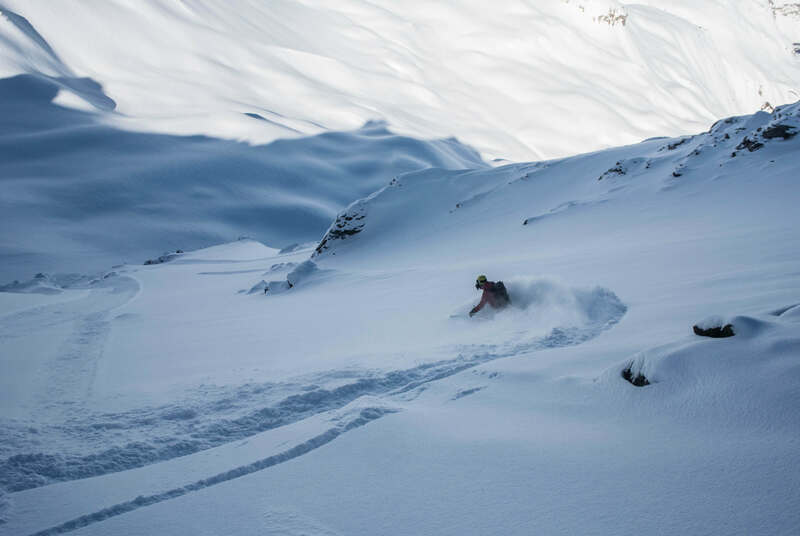 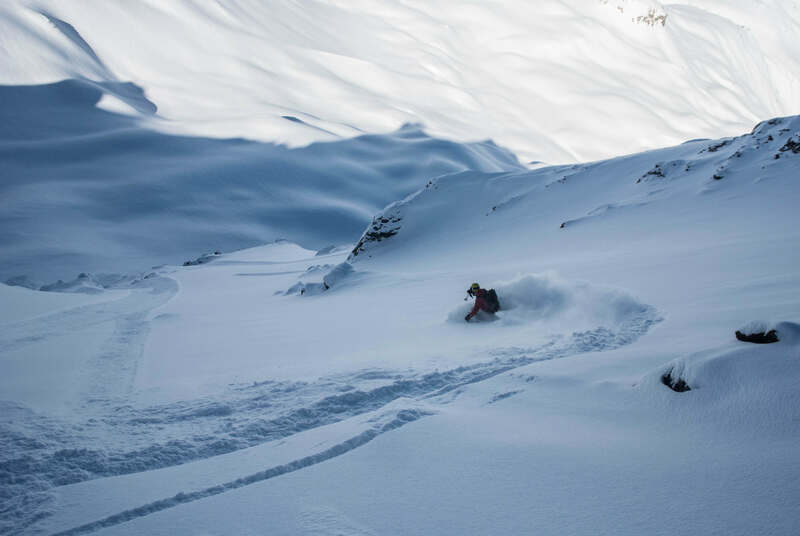 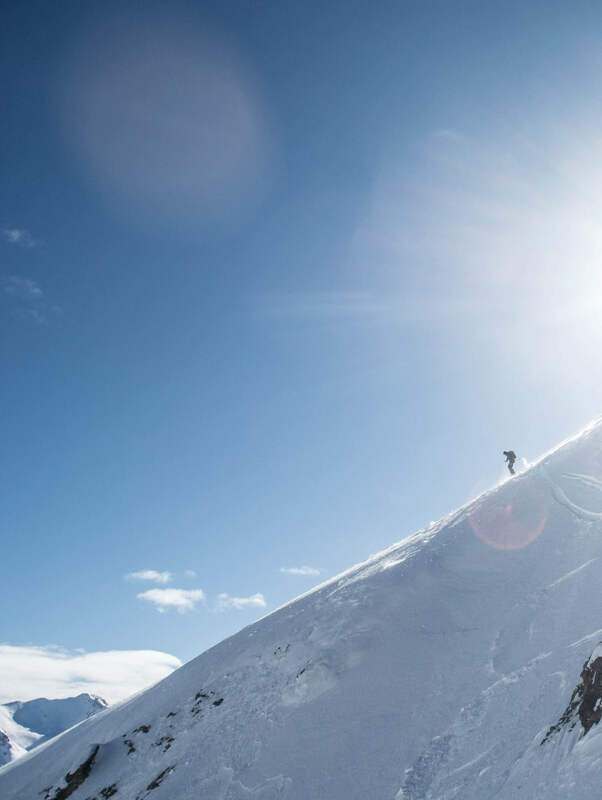 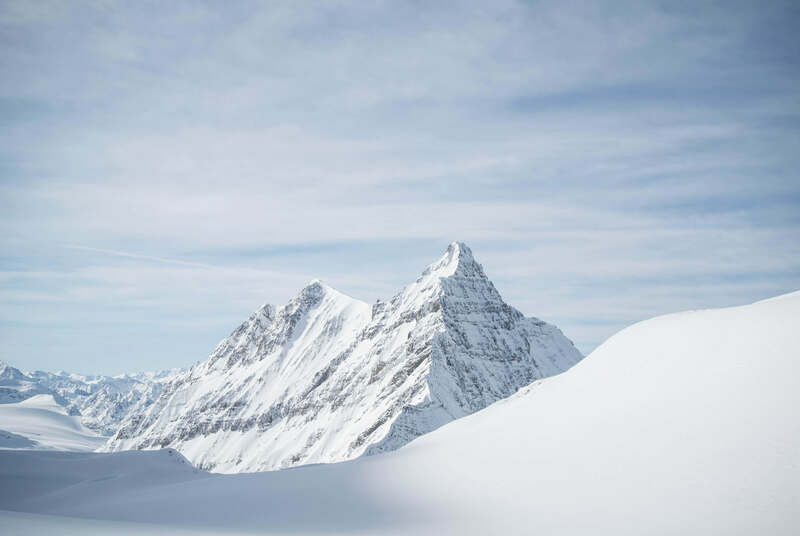 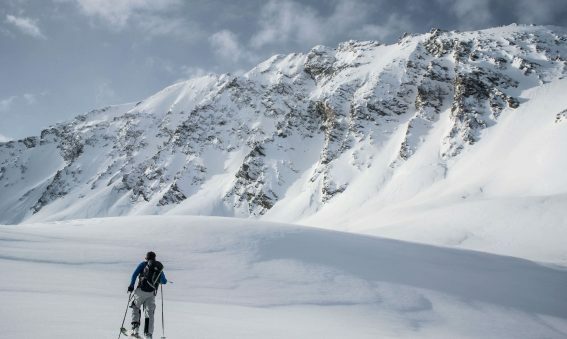 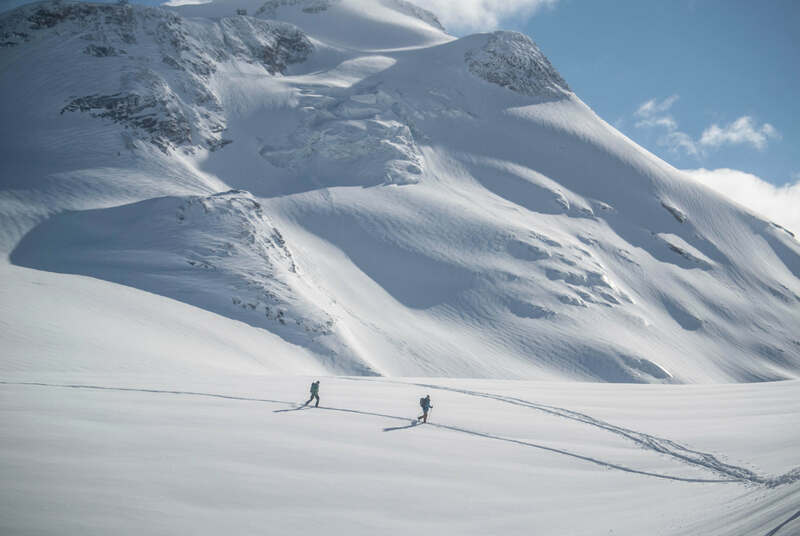 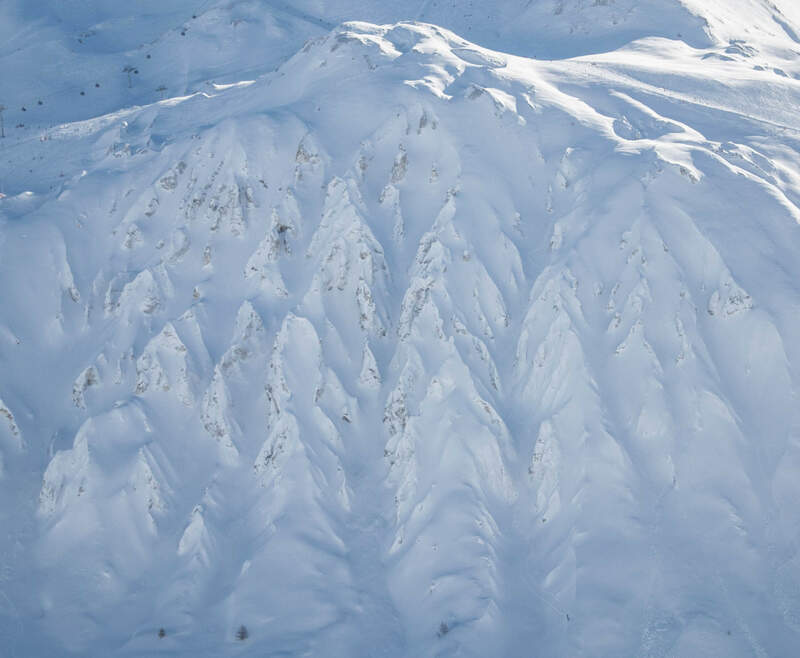 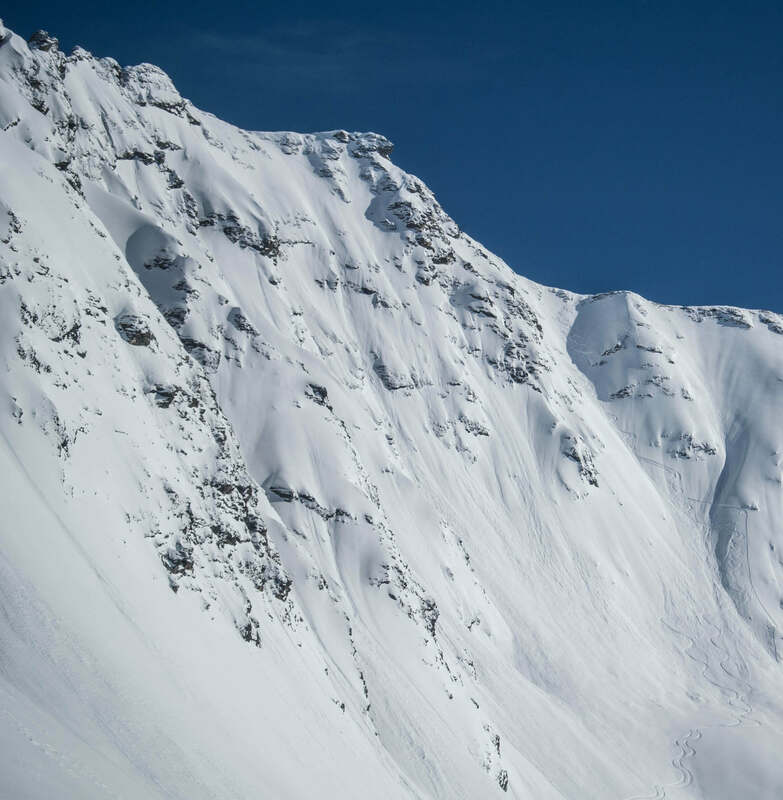 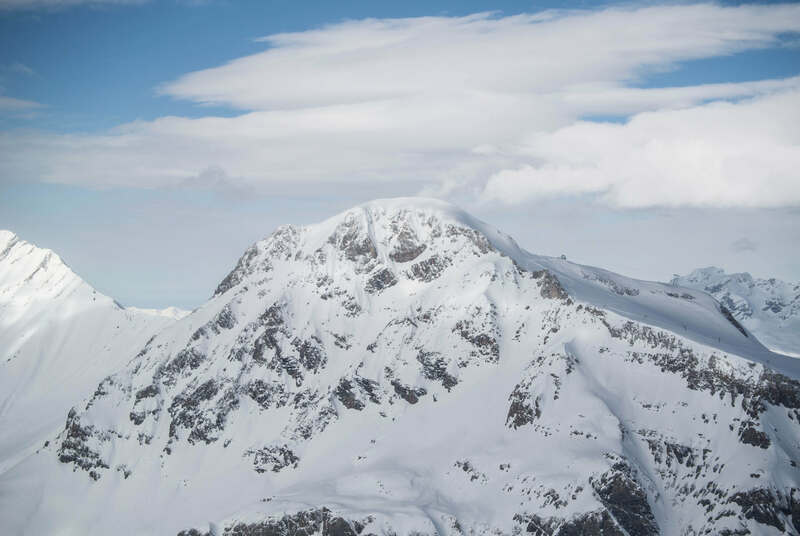 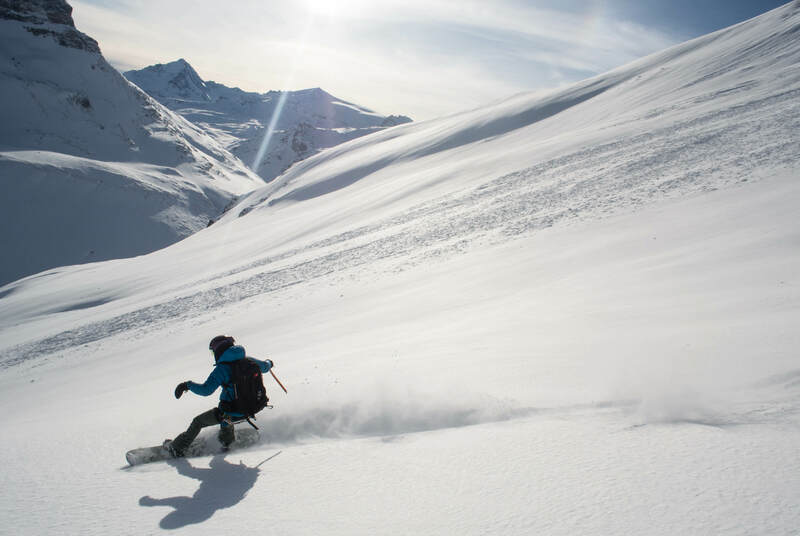 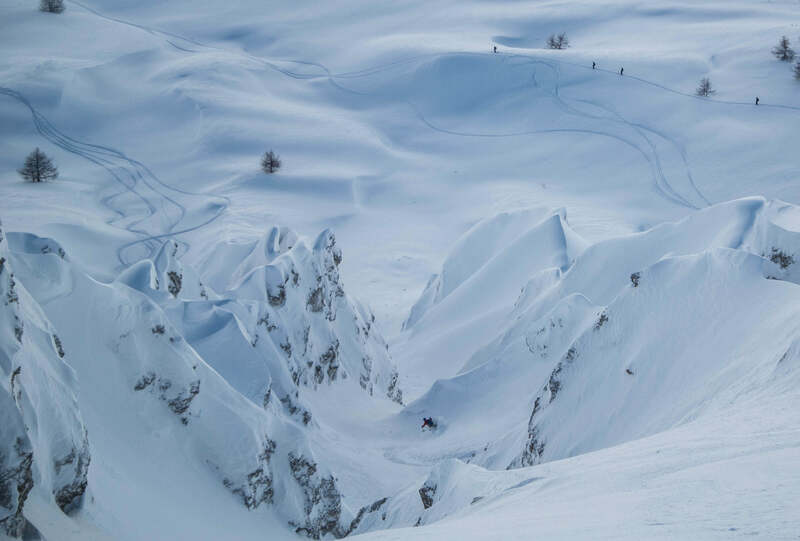 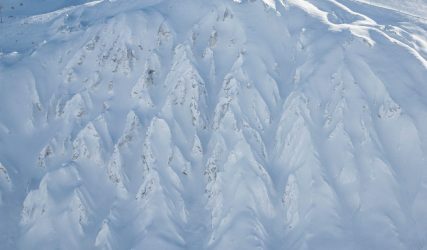 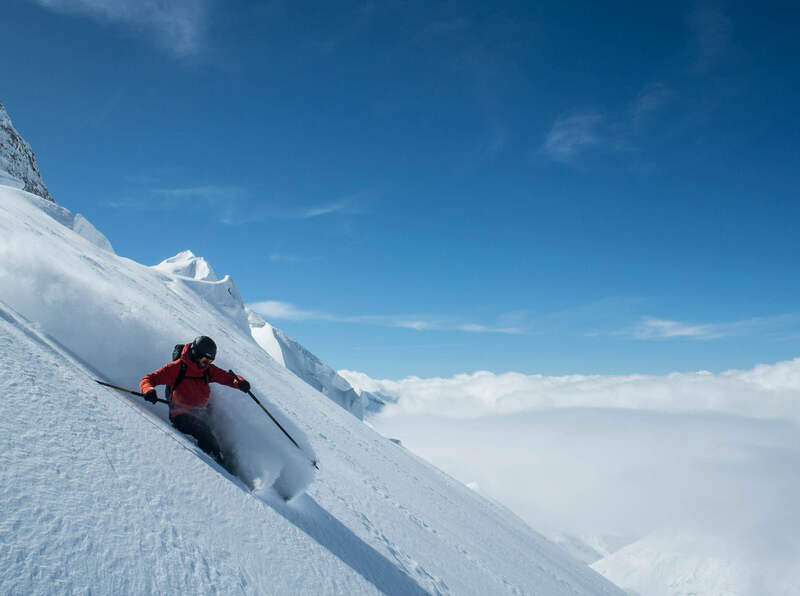 The journal includes some ramblings (you’ll have to excuse them as they were written at 23:00 between manic Heliski trips!) 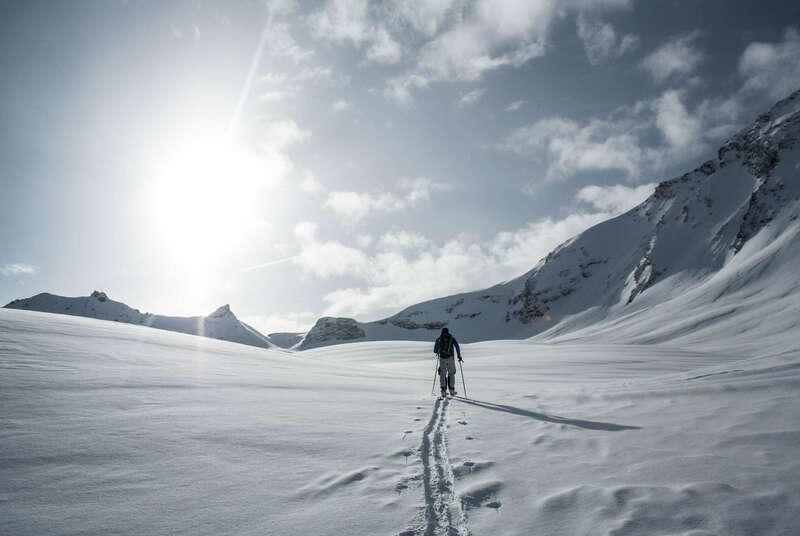 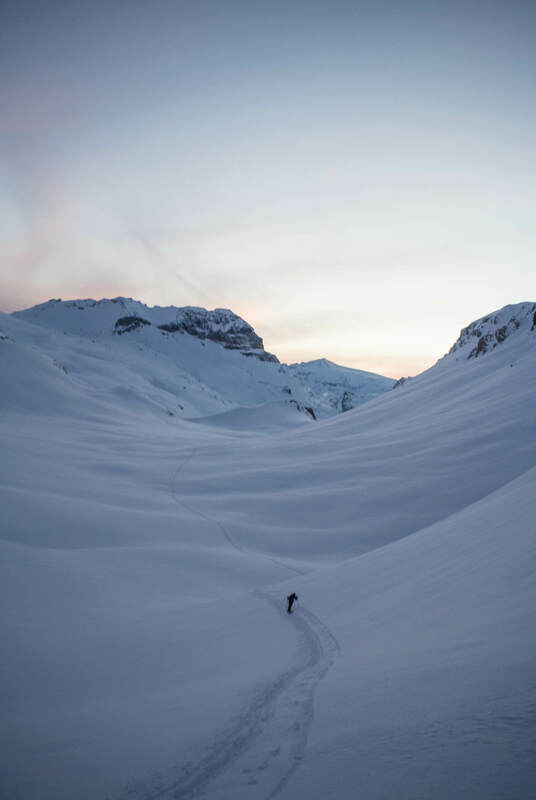 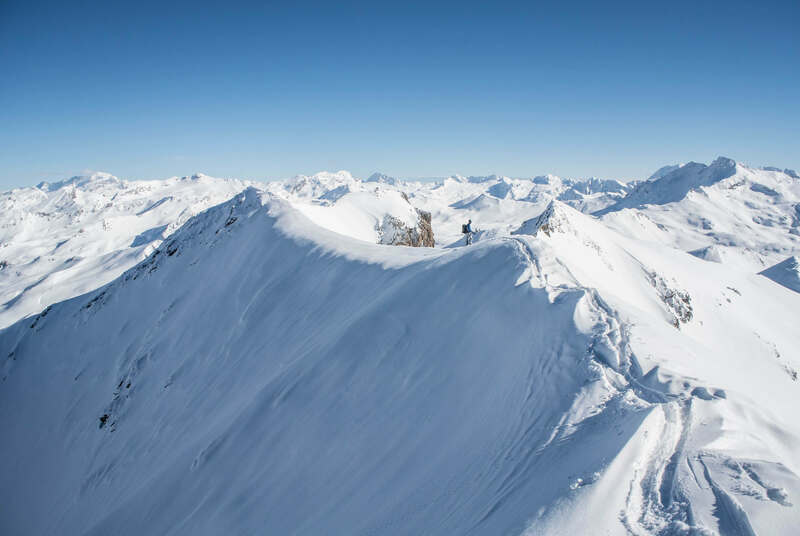 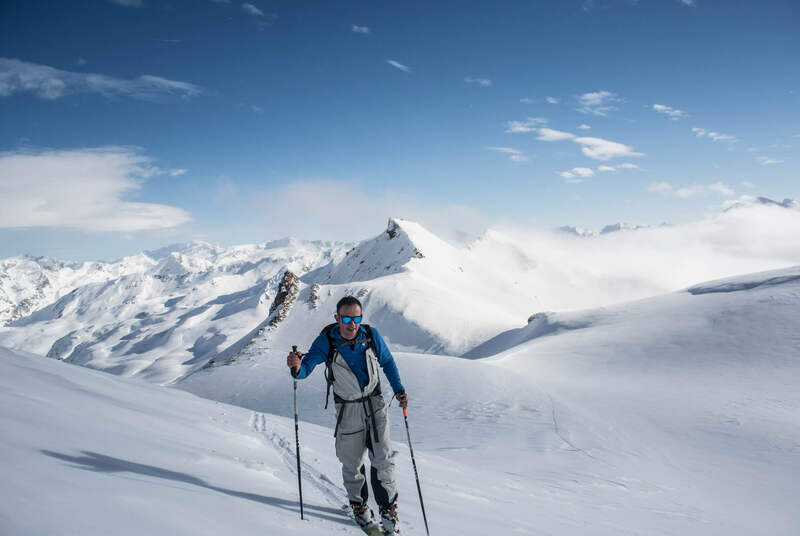 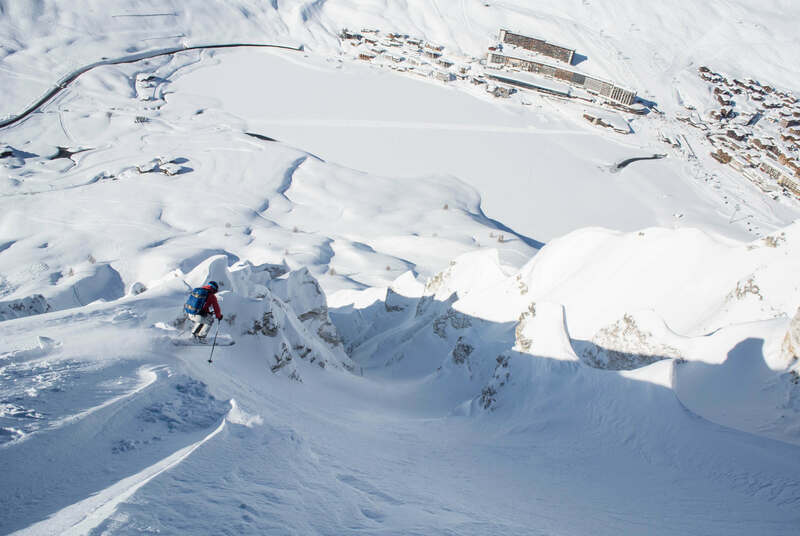 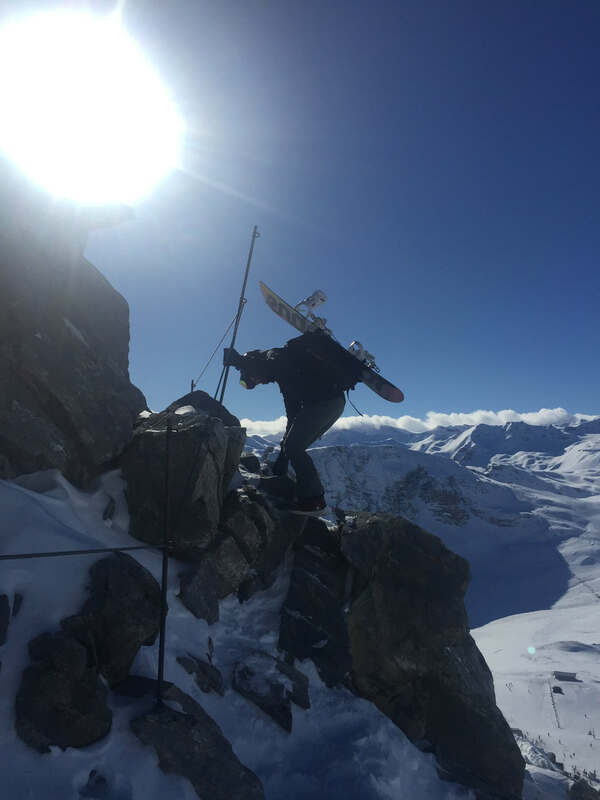 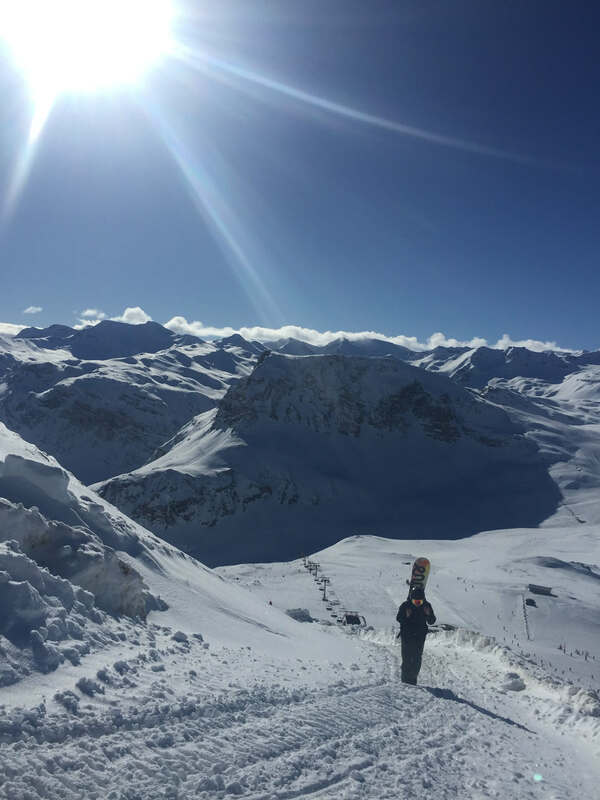 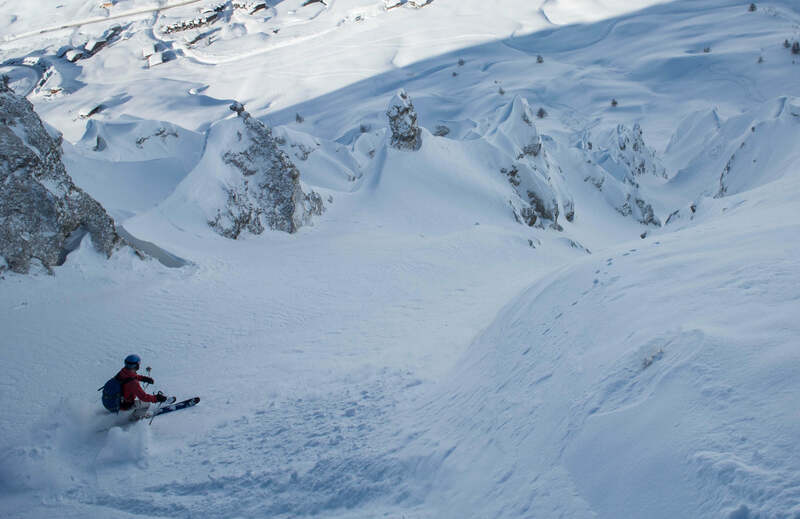 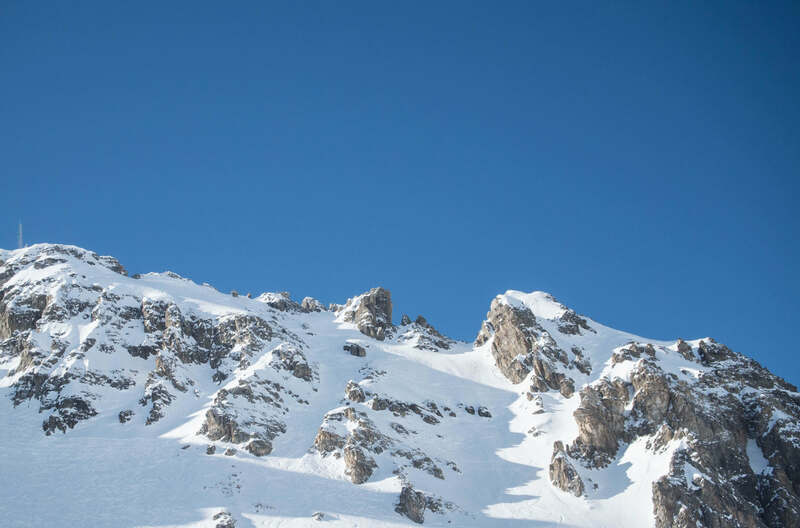 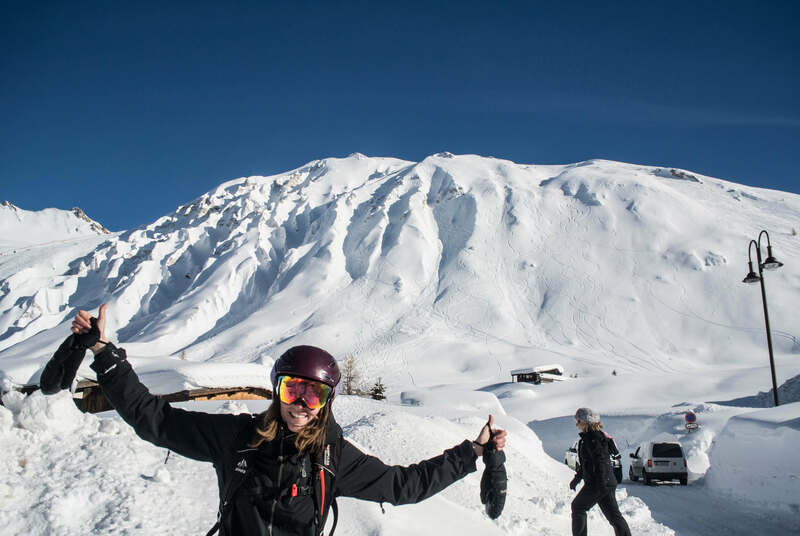 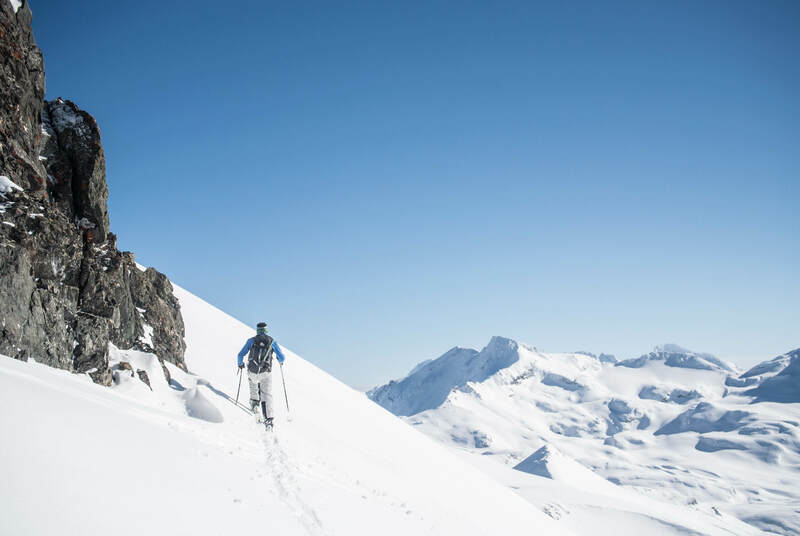 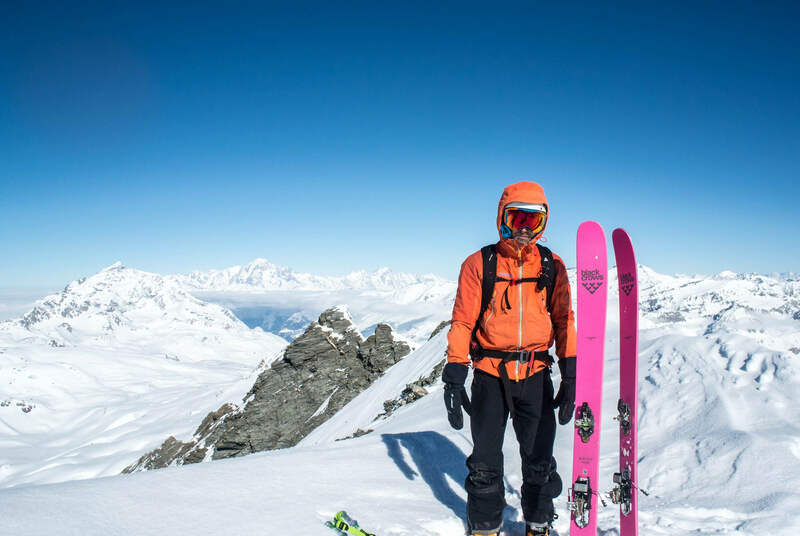 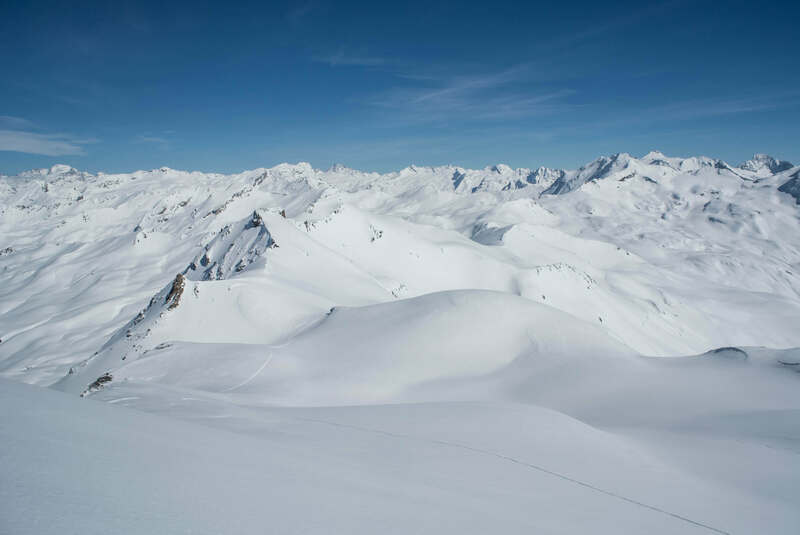 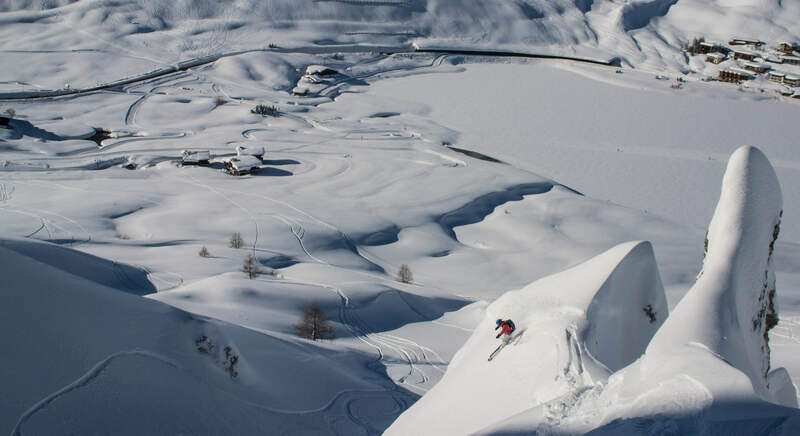 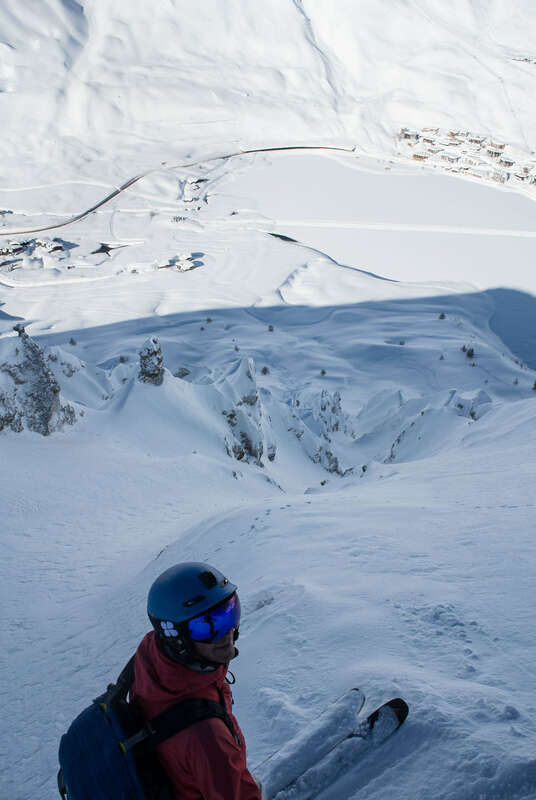 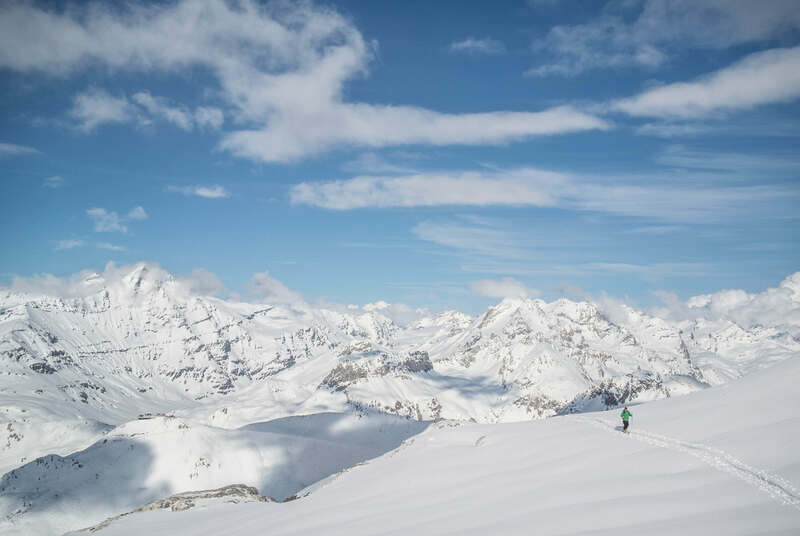 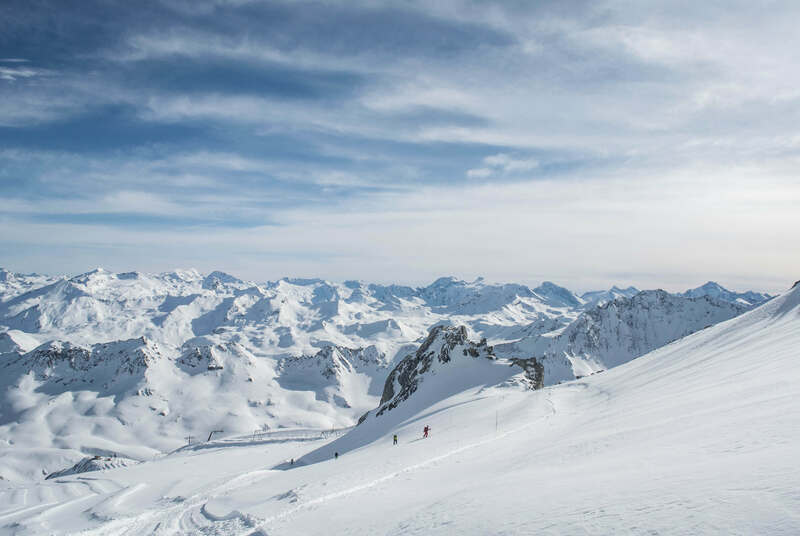 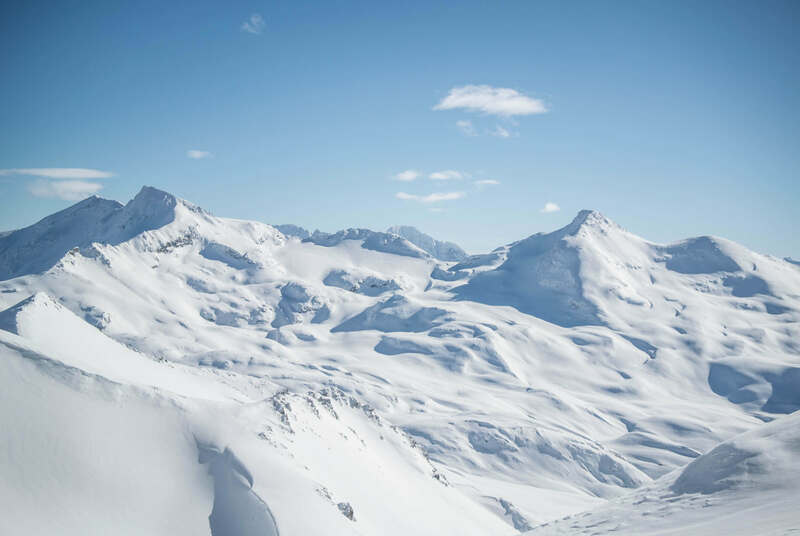 trying to explain exactly why it is we live out here in Tignes, plans for the future and why we do what we do, enjoy the read if you bother! 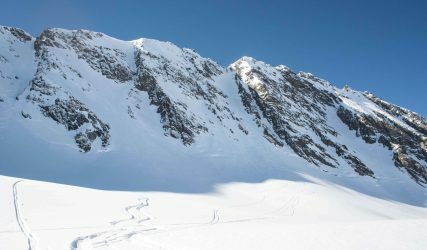 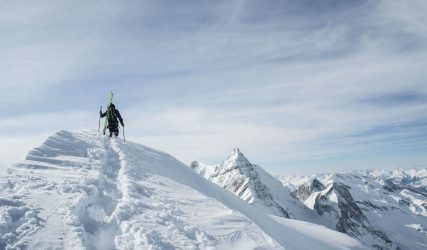 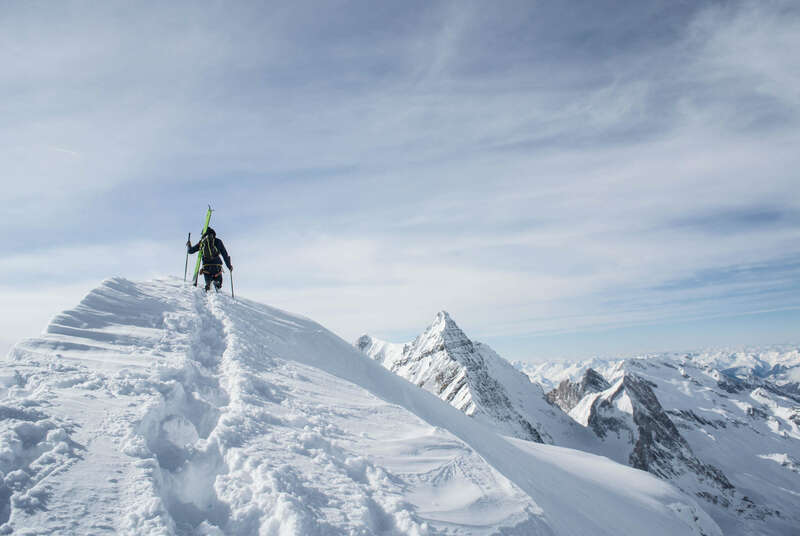 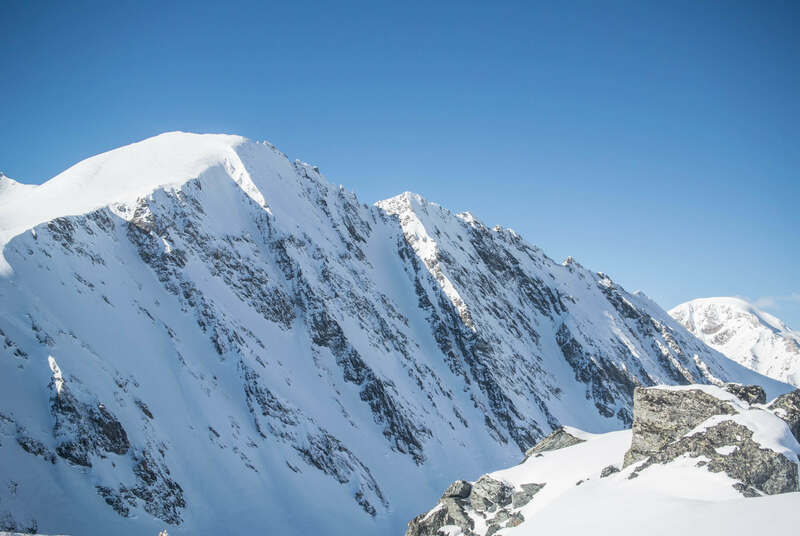 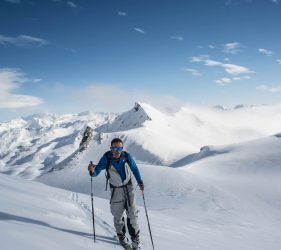 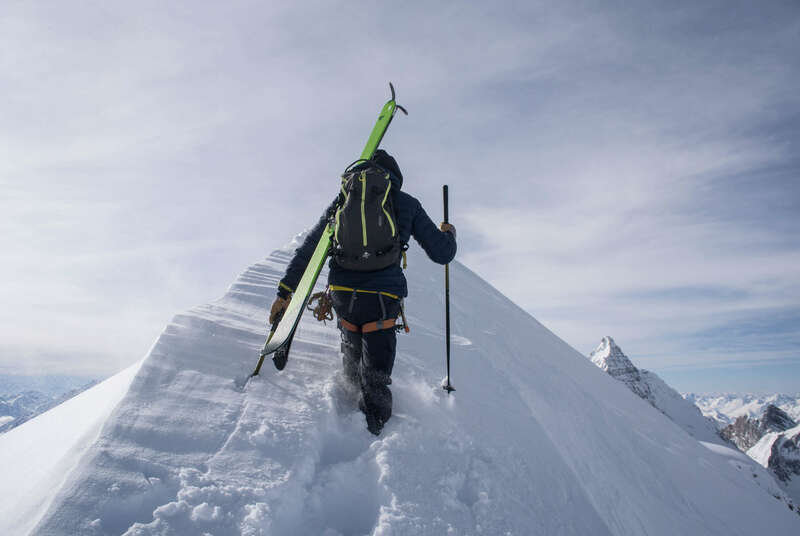 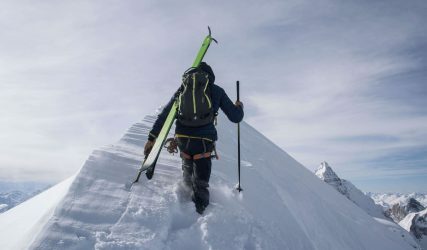 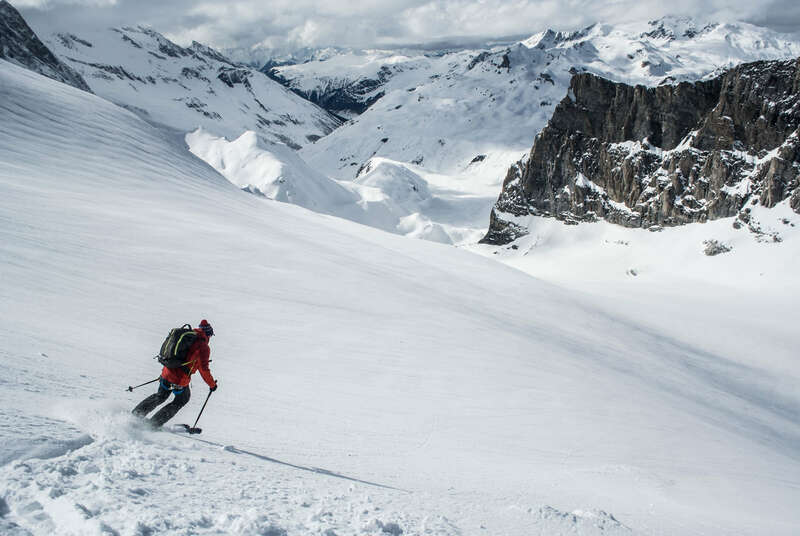 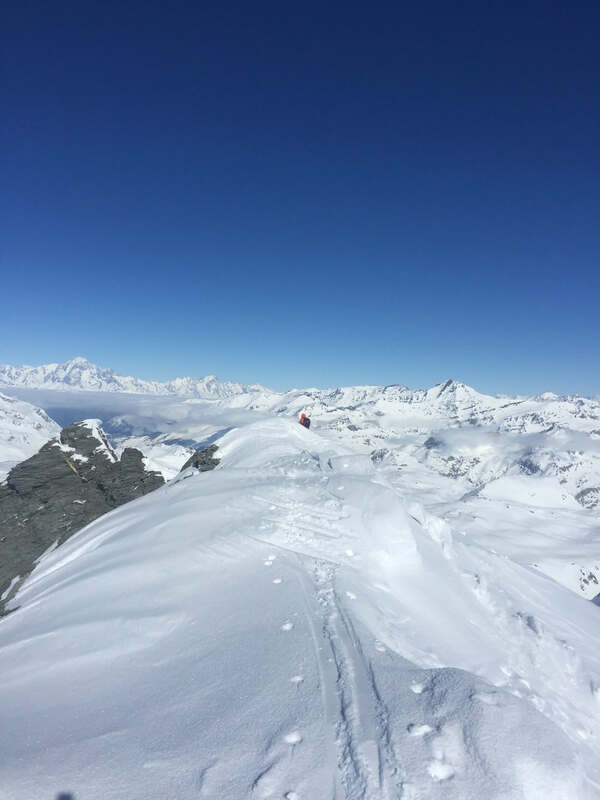 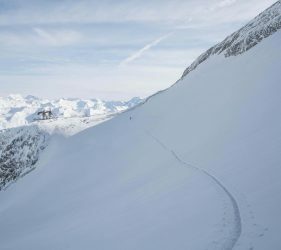 It felt great to finally be able to ski the ENE Face of Pointe de la Sana and in perfect conditions too, giving a really fast and straight-forward descent. 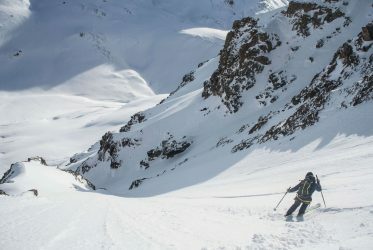 I had planned to ski the face alone but after sending out a message to my close ski partners, Adam said that he’d be keen to join me on the day. 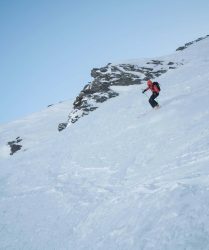 We were also aware that a group from TDC Tignes were heading for the face too, so an early start was arranged. 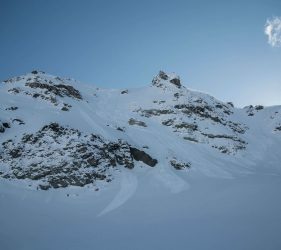 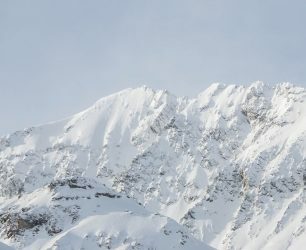 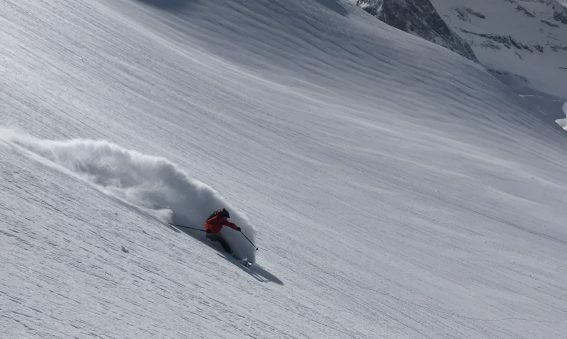 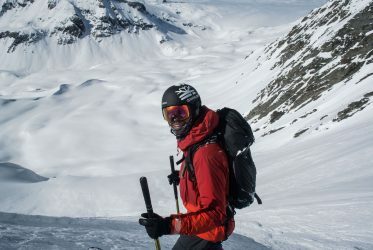 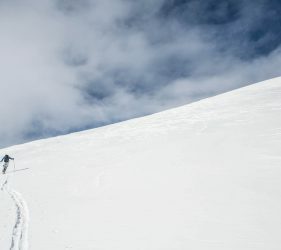 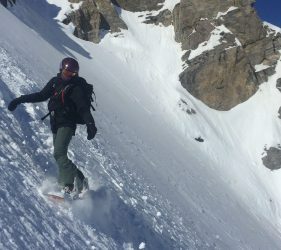 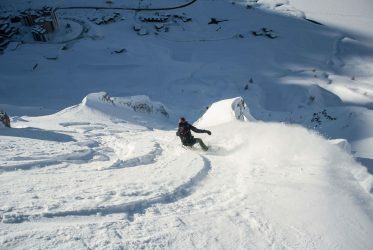 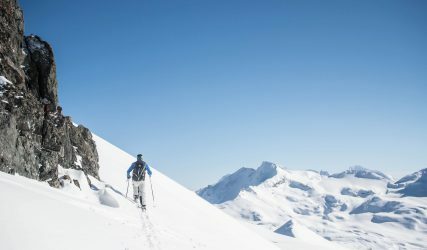 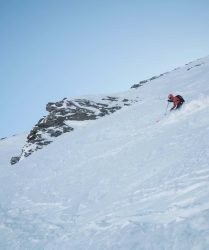 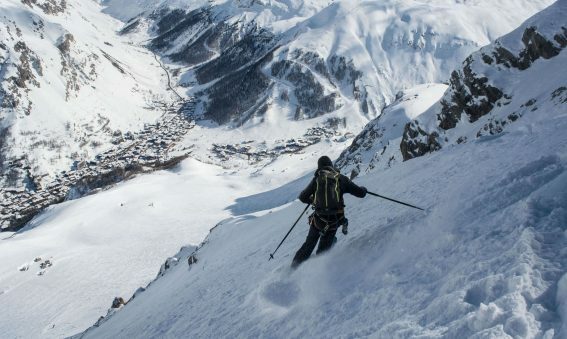 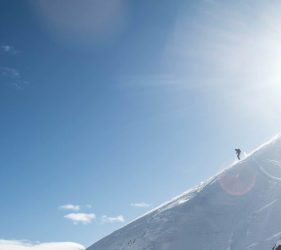 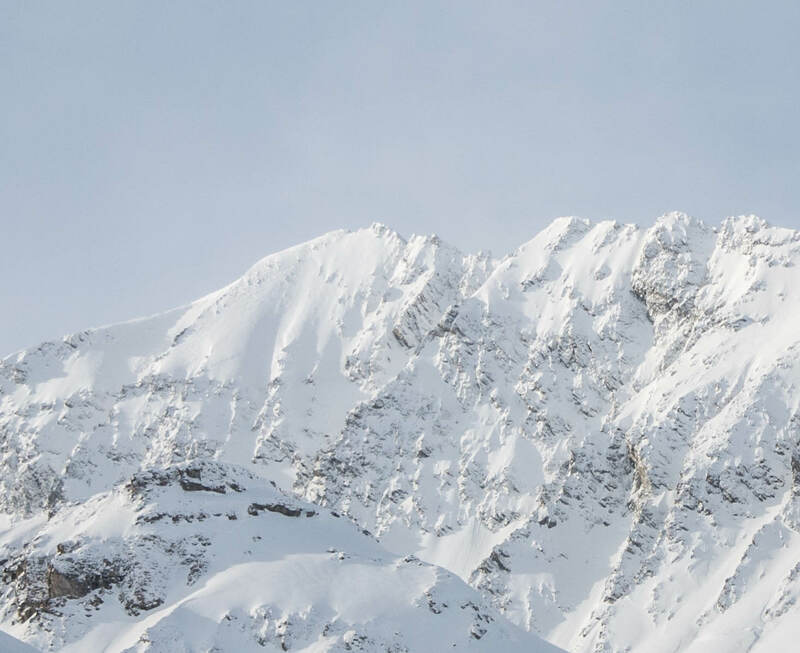 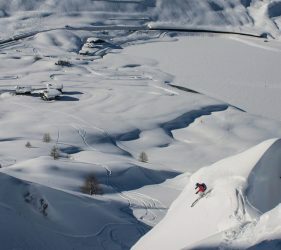 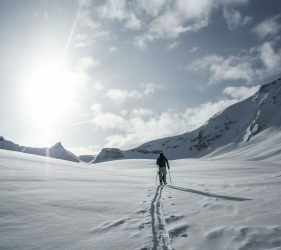 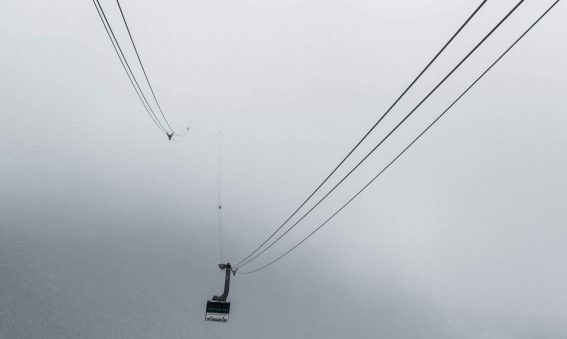 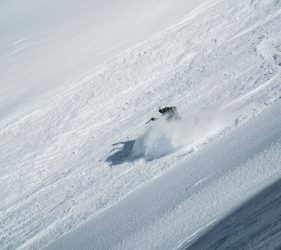 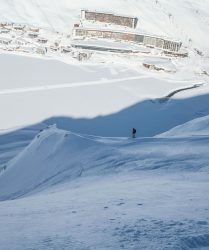 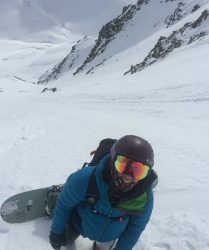 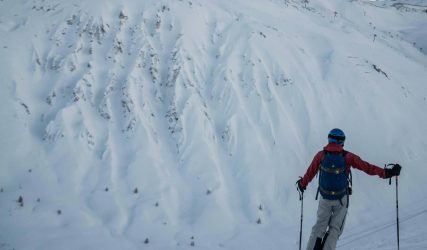 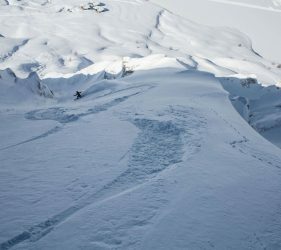 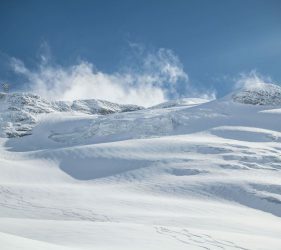 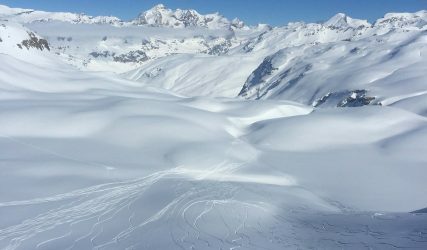 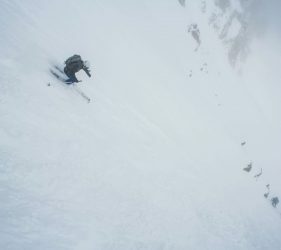 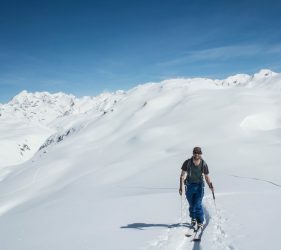 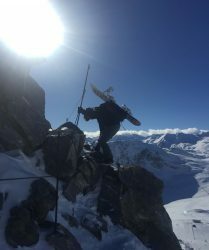 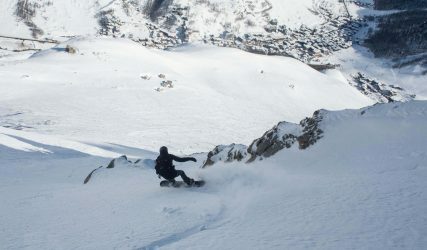 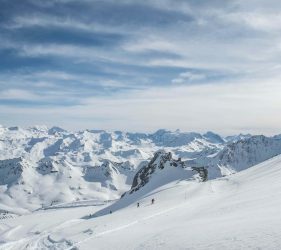 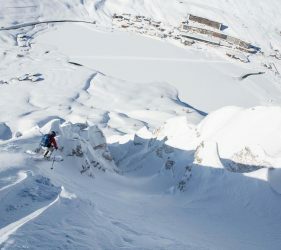 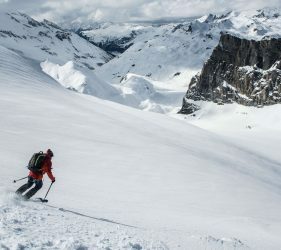 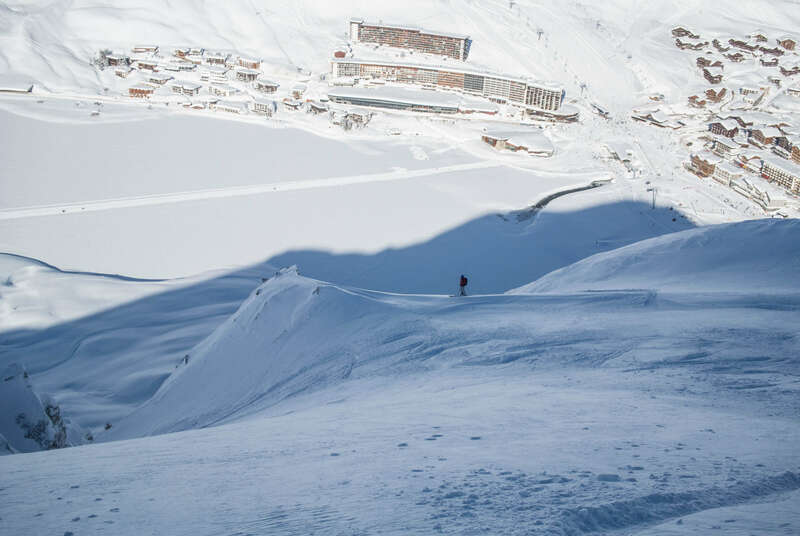 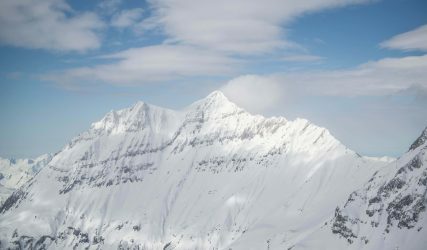 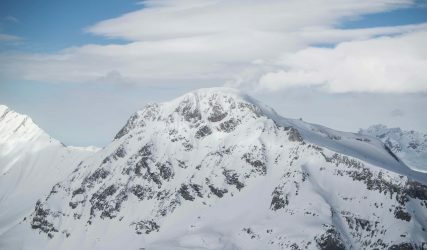 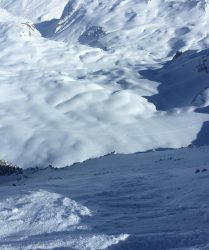 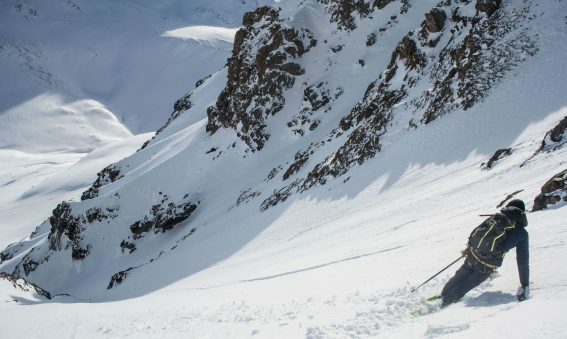 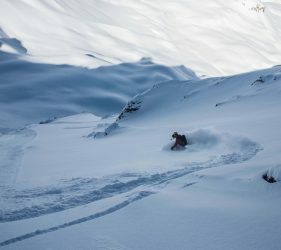 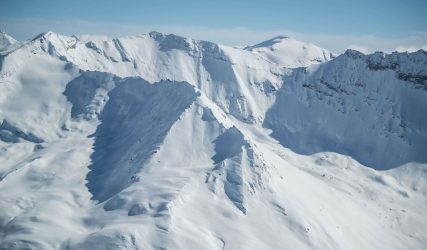 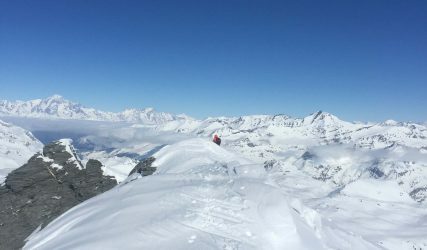 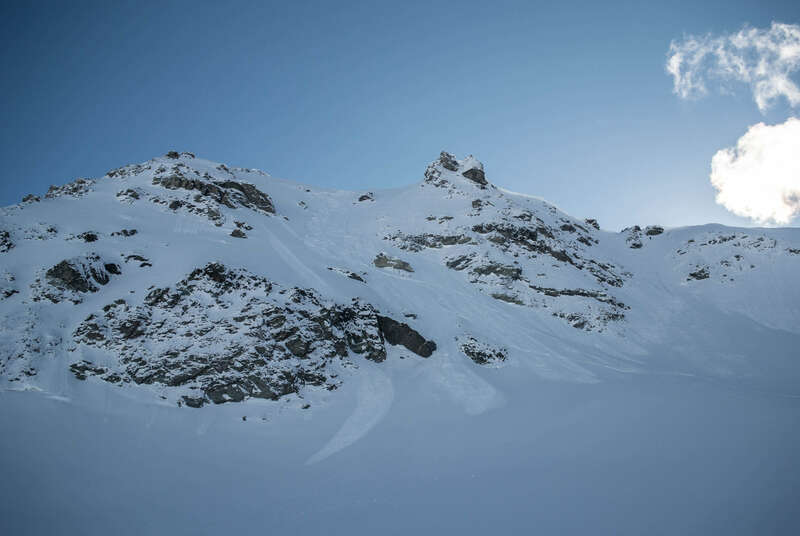 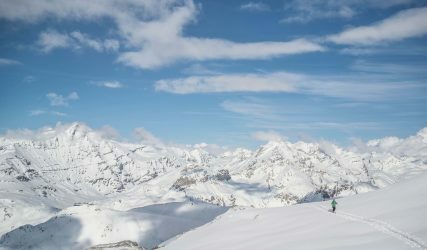 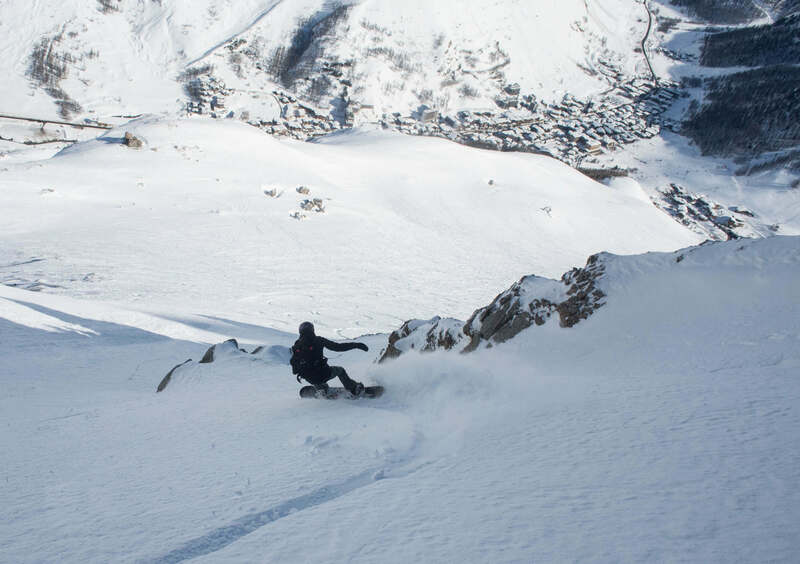 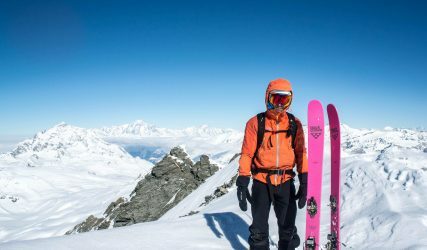 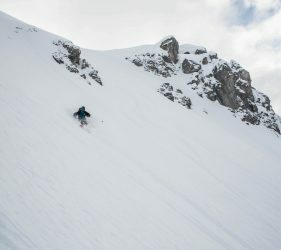 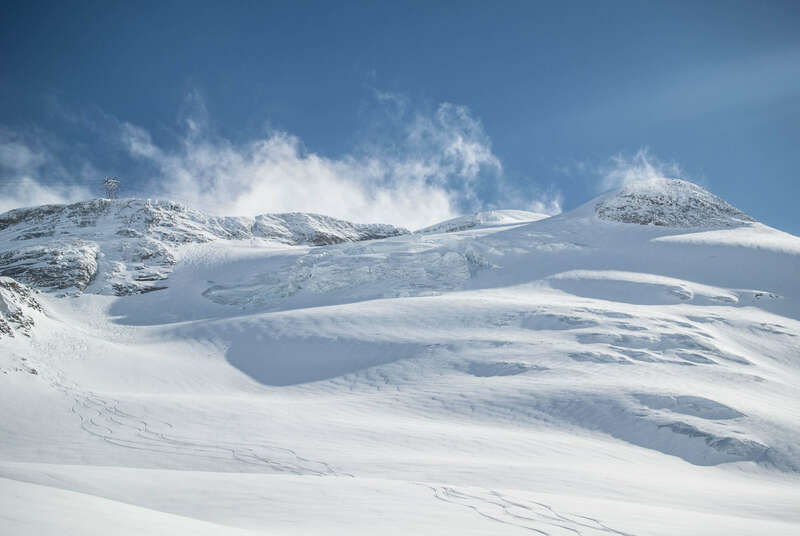 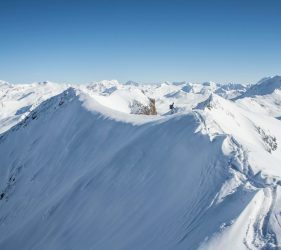 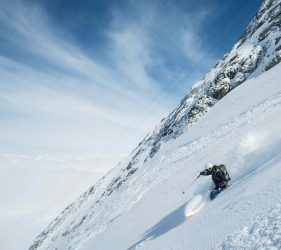 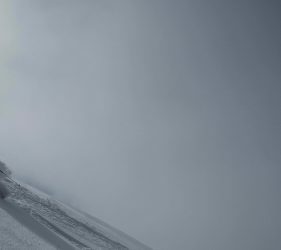 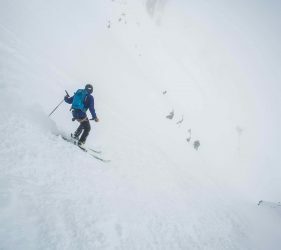 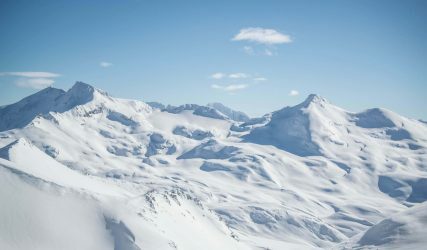 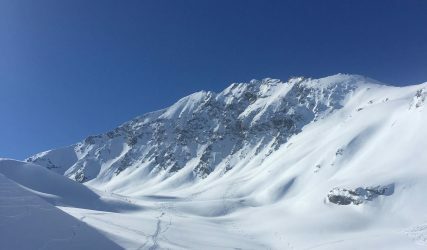 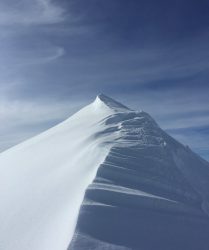 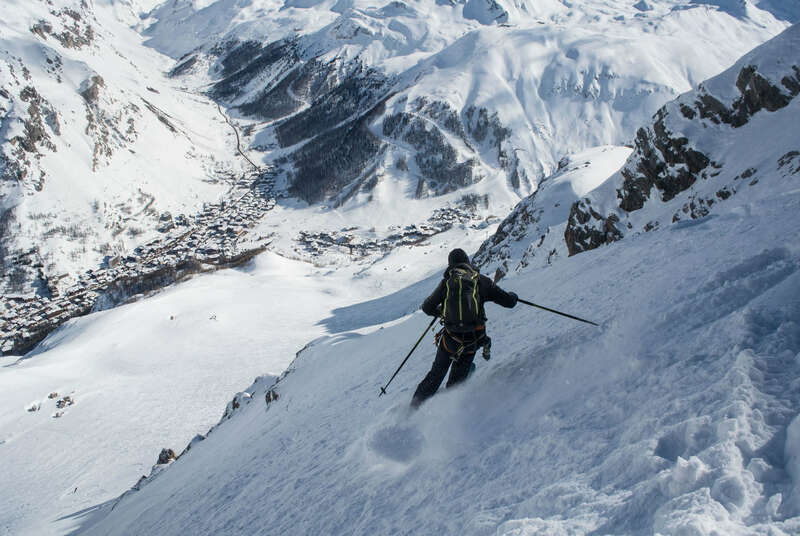 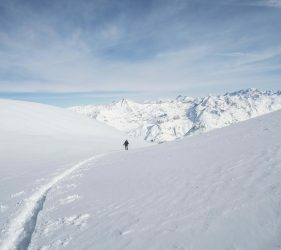 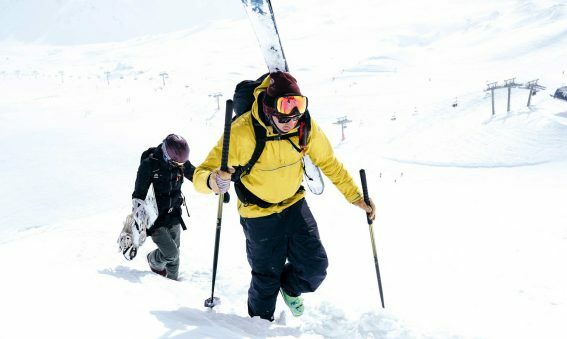 I have always turned around on previous attempts at skiing the face due to unstable avalanche conditions, but I was stoked to hear that the face had already been skied 2 days previously and that Val d’Isère and Tignes were reporting a stable snowpack, with an avalanche advisory of 1/2 for the day. 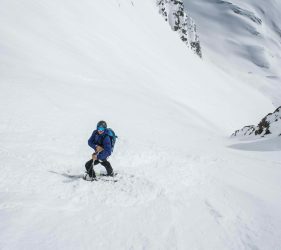 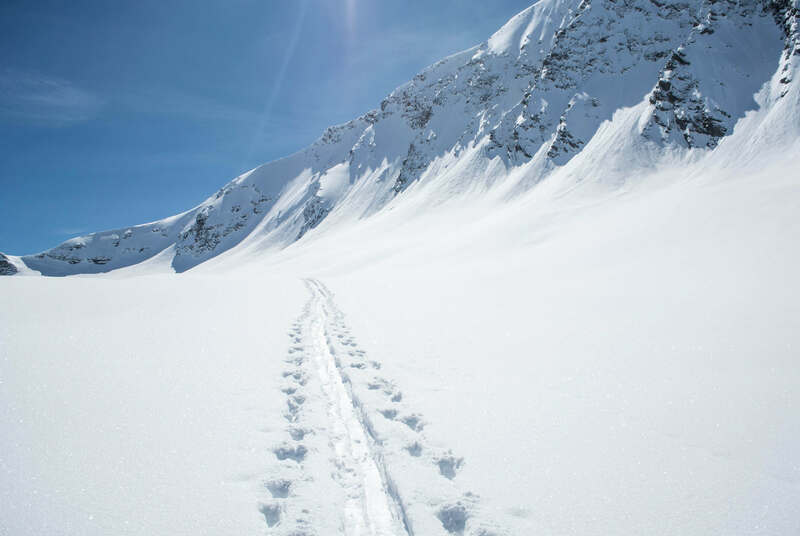 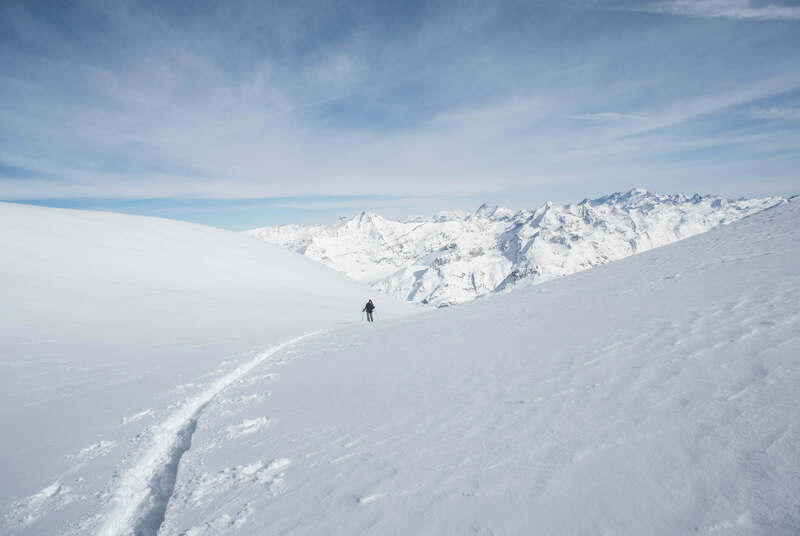 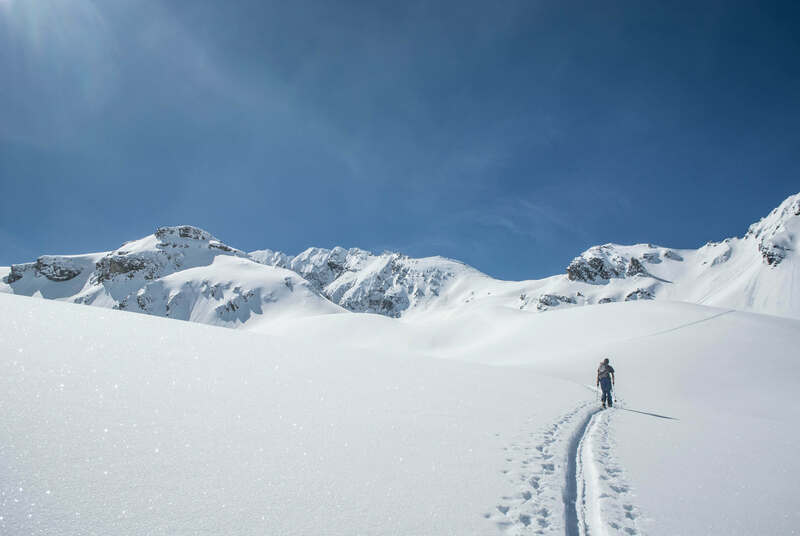 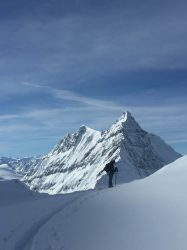 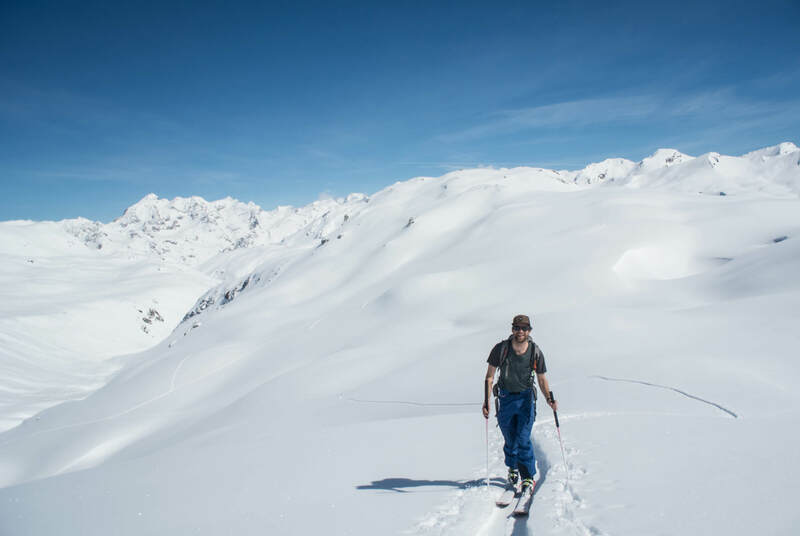 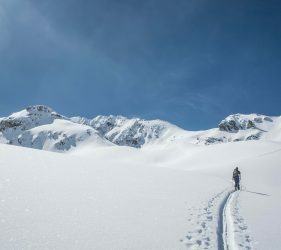 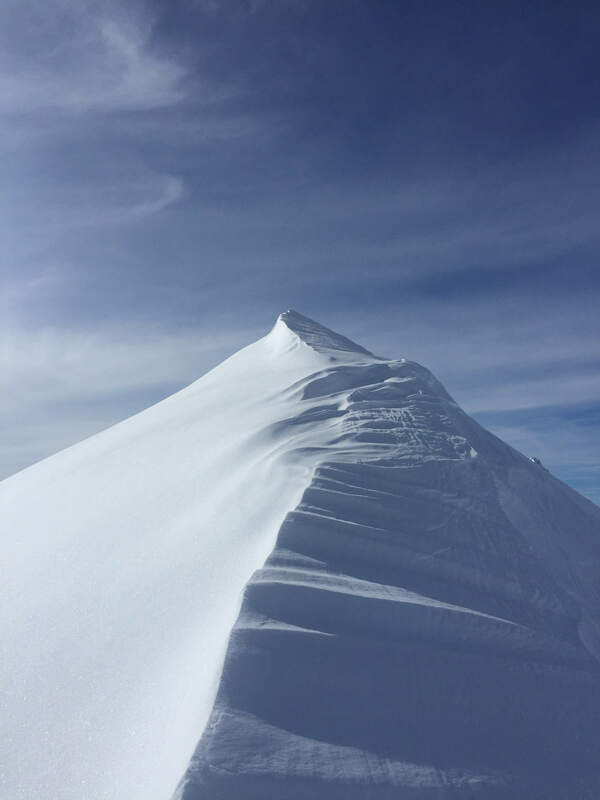 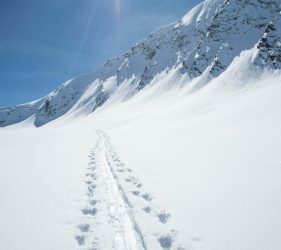 This all made the skin up quite enjoyable as there was no apprehension as to whether the face will be skiable or not – it was good to know that it would go today! 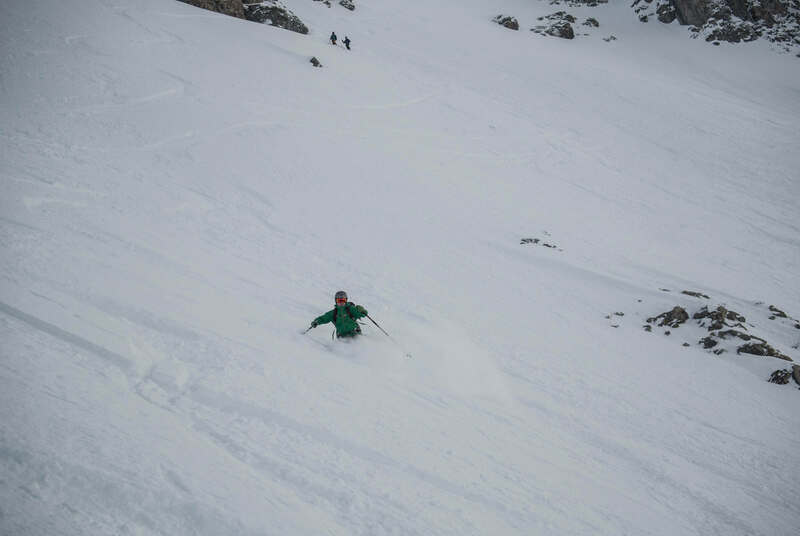 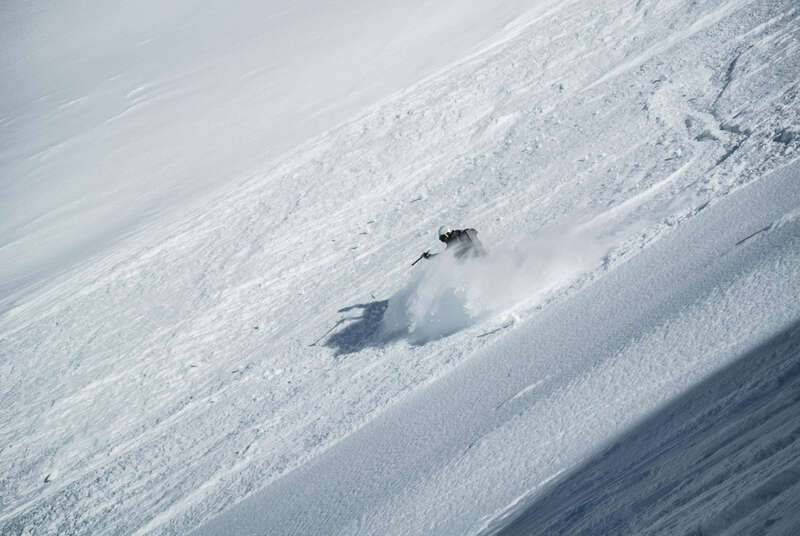 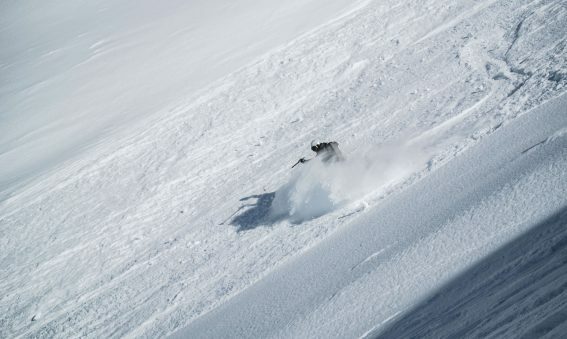 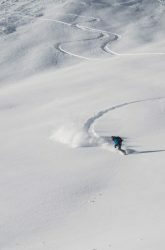 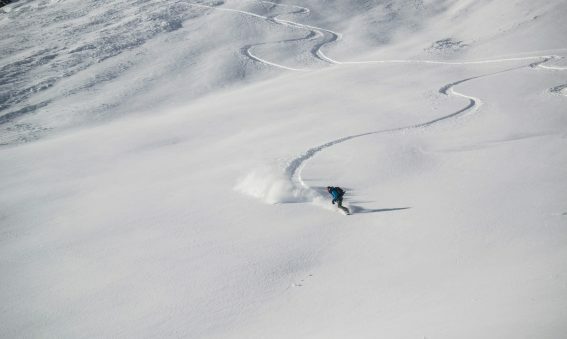 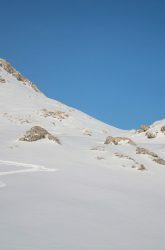 Conditions excellent, with a little stable powder to be found in the shallow couloirs on the face. 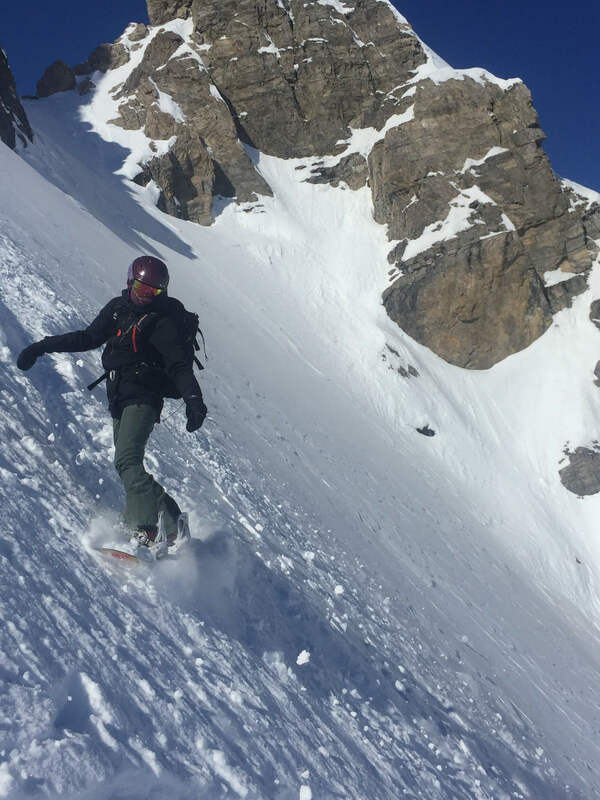 This allowed us to ski the entire face one at a time with no worries at all, stopping just before the traverse into the east couloir. 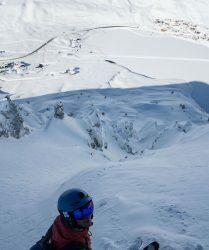 The top of the ENE Face of Pointe de la Sana - steep and nicely exposed! 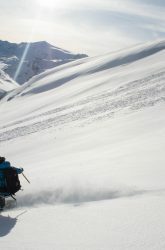 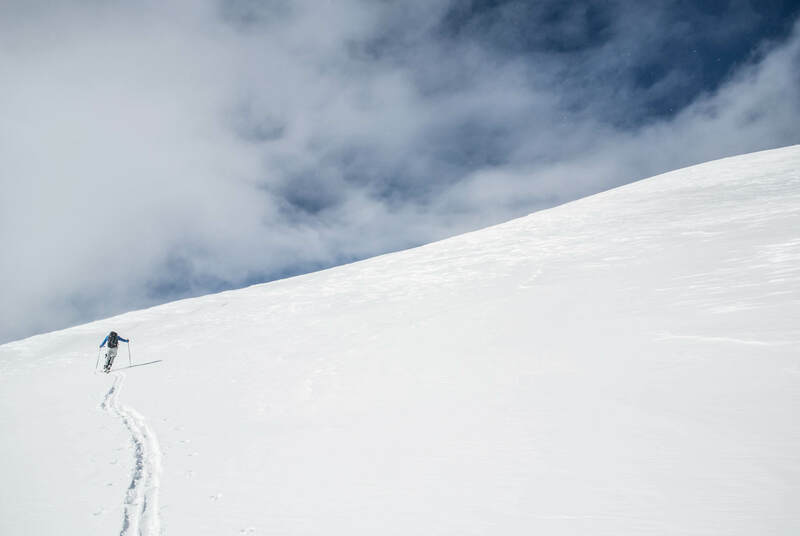 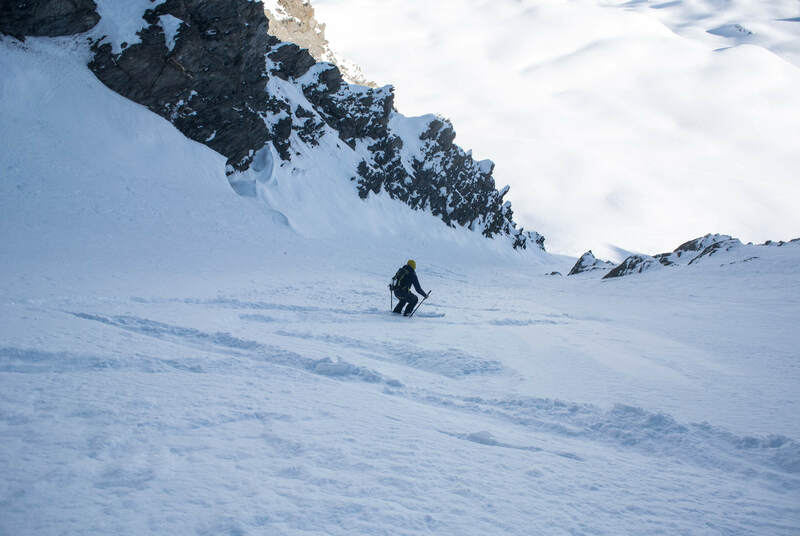 We returned to the Manchet valley via the Tour du Charvet, which gave an amazing descent in cruisy boot top powder! 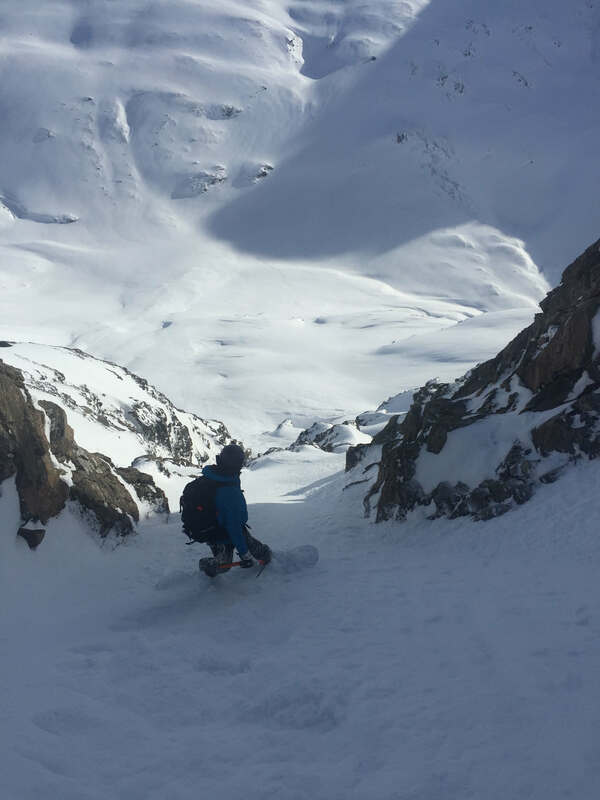 A quick lunchtime hit over on the NE face of the Bellevarde in Antenna Couloir, finding some pretty decent snow on the northerly aspects and slightly more wind affected snow on the easterly aspects. Antenna Couloir is reached the same way as Orientation Table Couloir up on the Bellevarde. 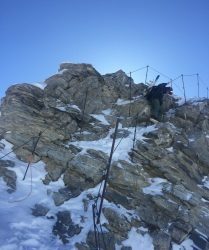 Just keep heading along the ridge and follow the fixed wires that are there for the Antenna staff to secure them as they cross the Bellevarde. 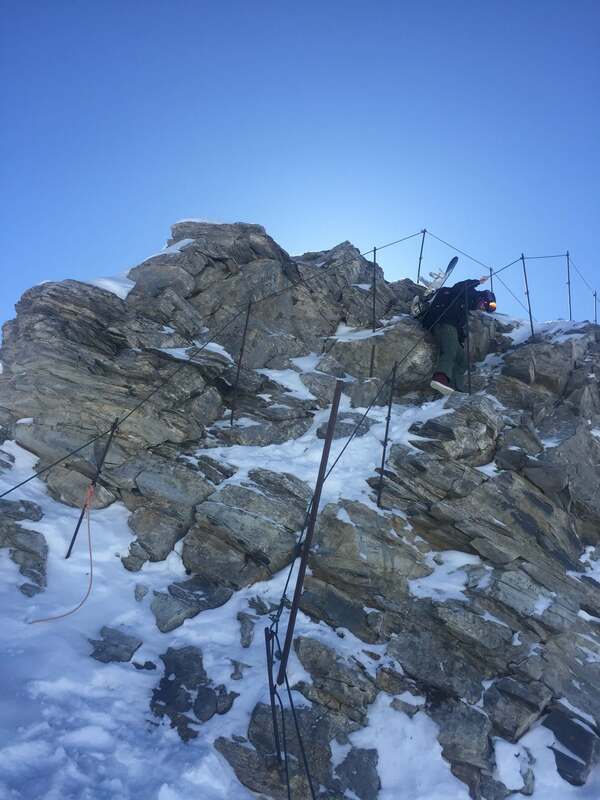 There is some easy climbing and downclimbing along the ridge, with the fixed wires serving an easy handrail for the balance-y downclimbs. 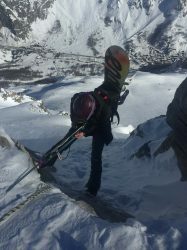 Keep walking past the big antenna (obvious) and you’ll reach a big boulder on a Col that usually has fixed tat around it. 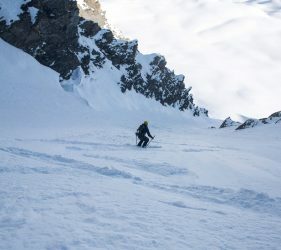 A short rappel leads to the top of the snowslope that you need to make a leftwards traverse across to reach the top of the couloirs. 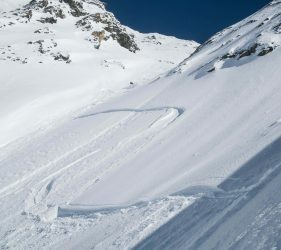 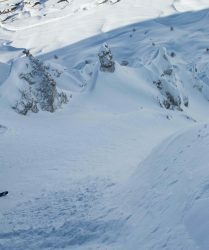 The couloirs are split in two, with a left and right variant possible. 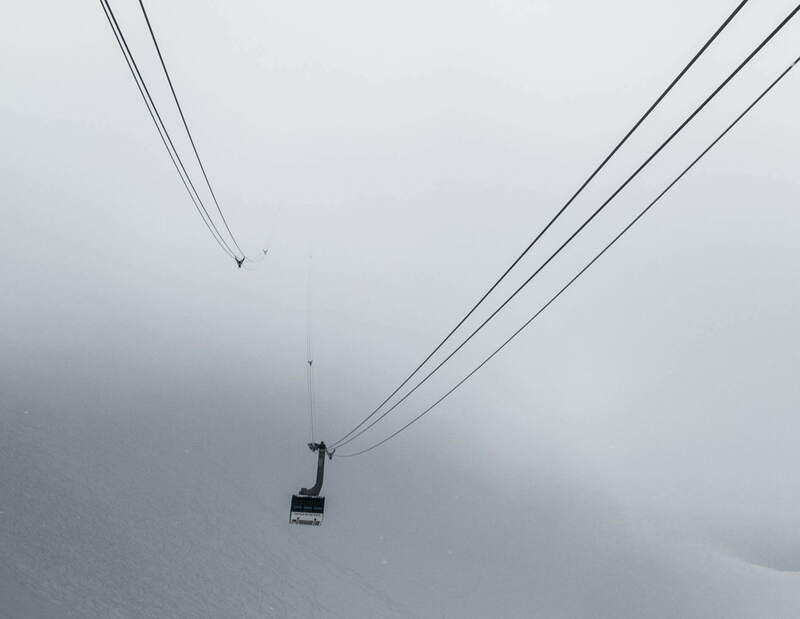 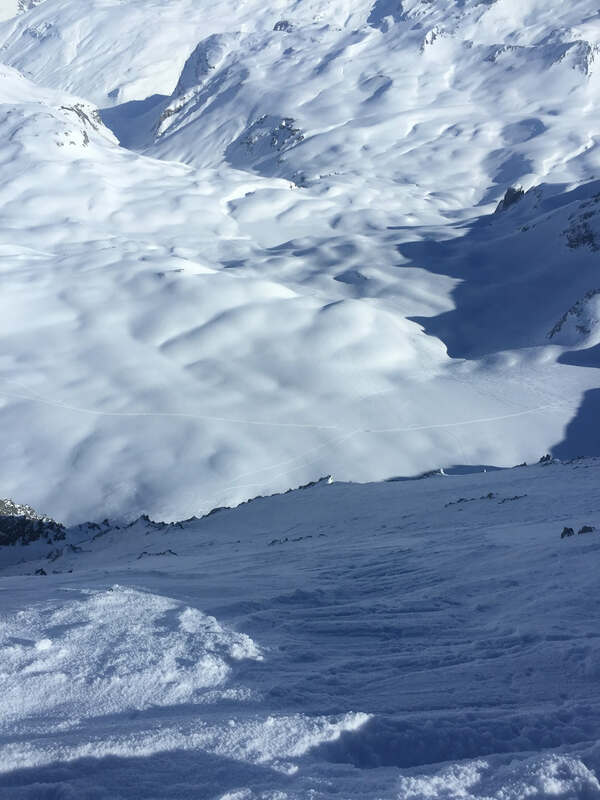 Get a good look up from Val d’Isère before if you’re not sure of the snow conditions in the couloirs. 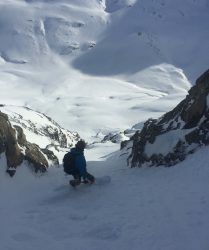 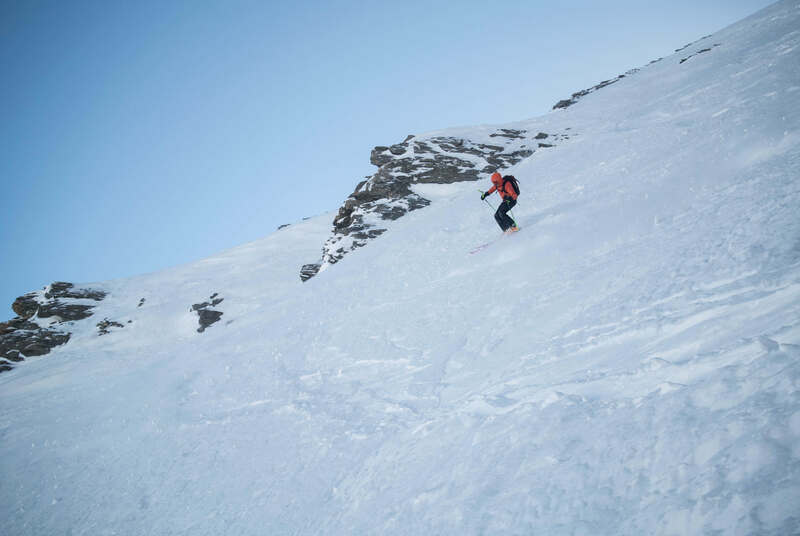 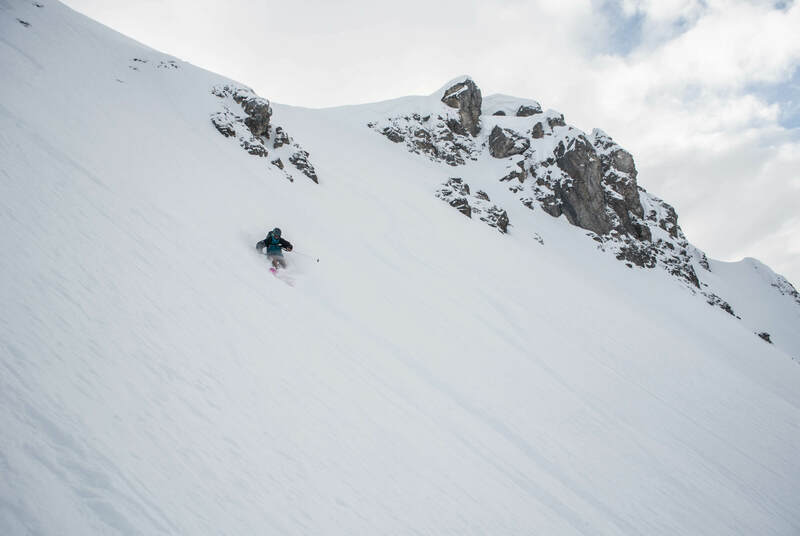 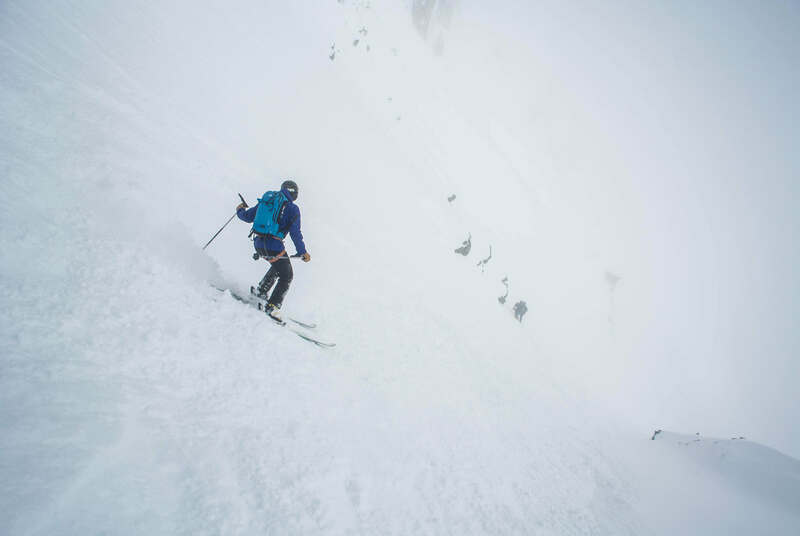 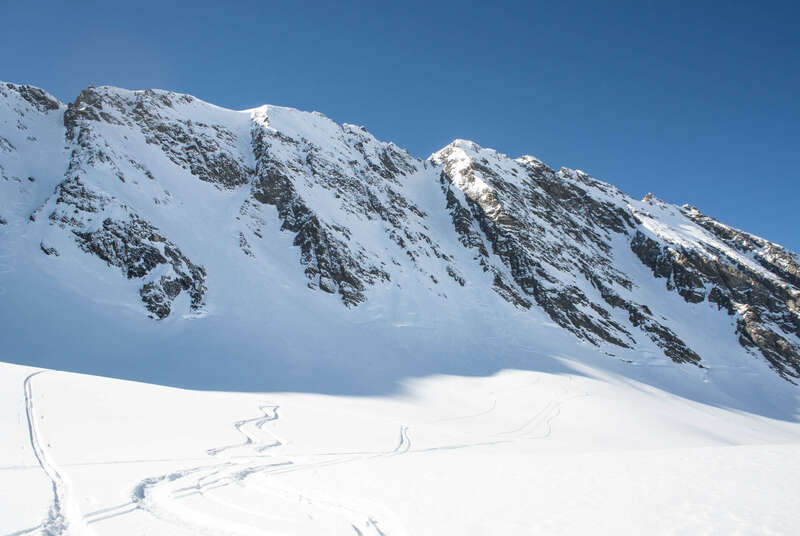 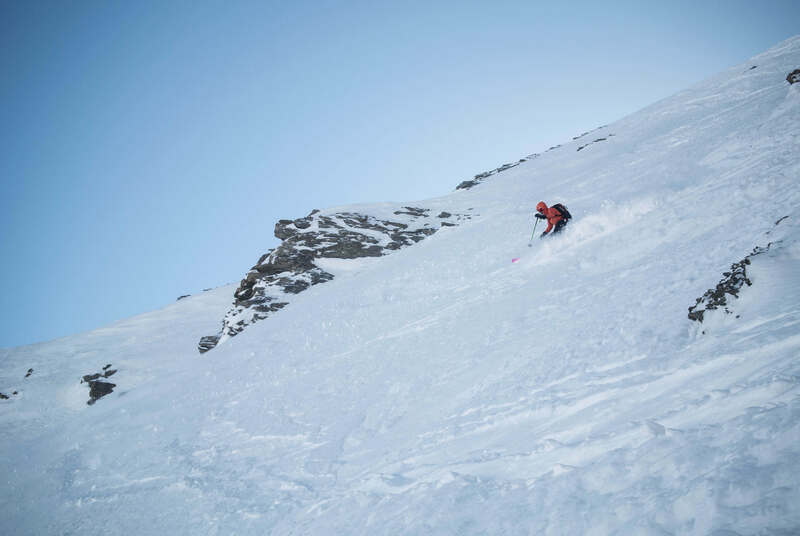 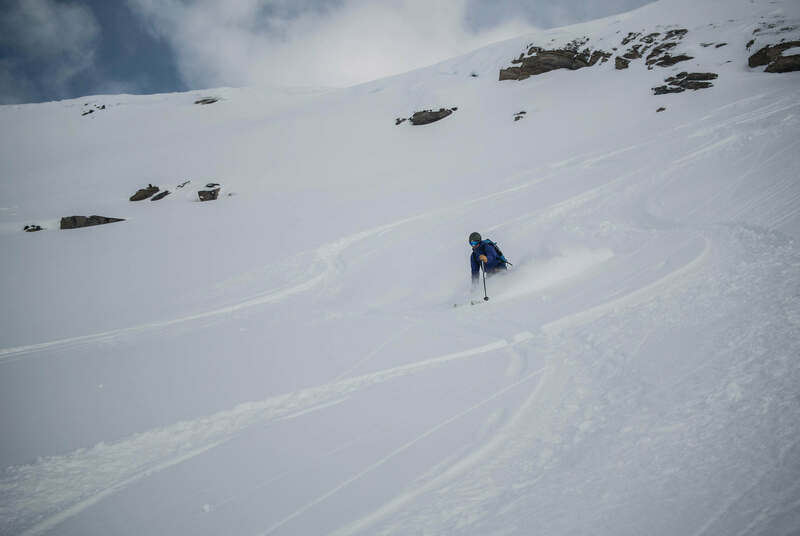 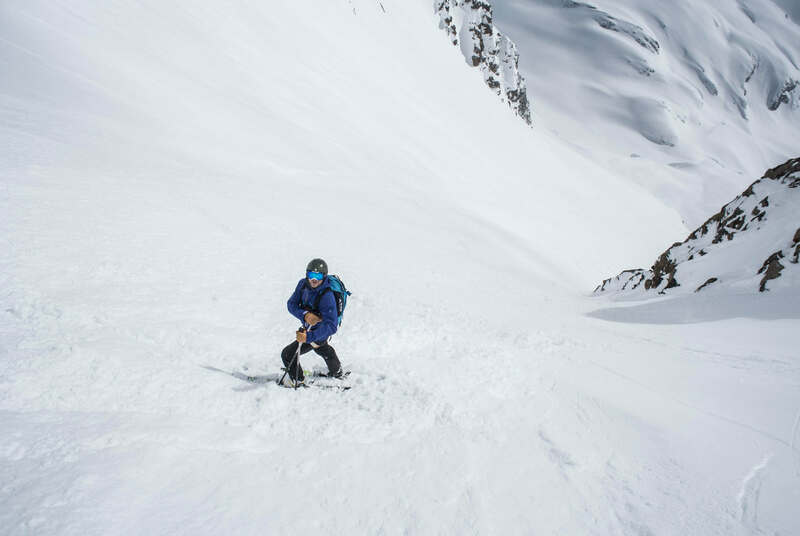 Once you’ve skied the couloir, it’s a pretty cool link up to head straight down to Côves couloirs, as long as the snow conditions are decent! 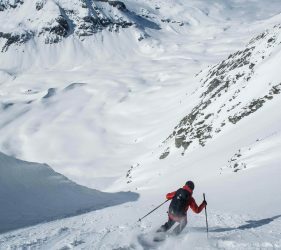 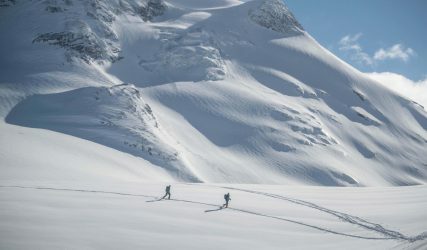 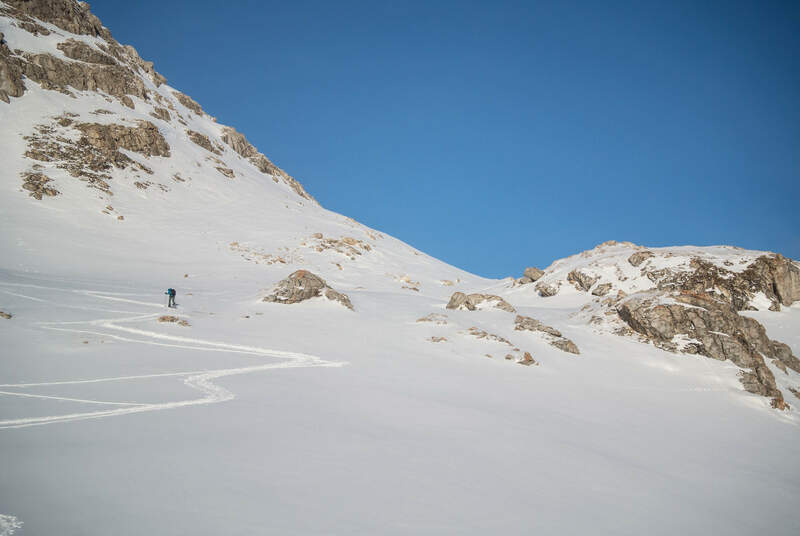 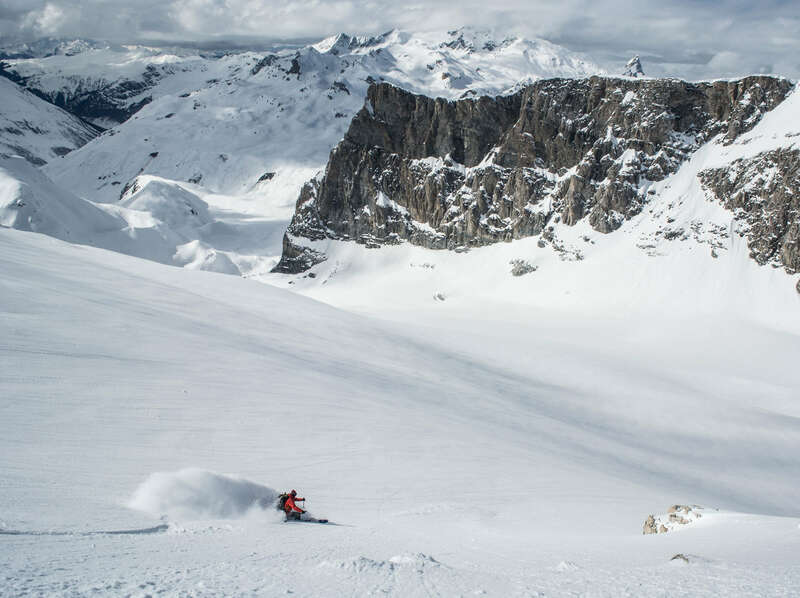 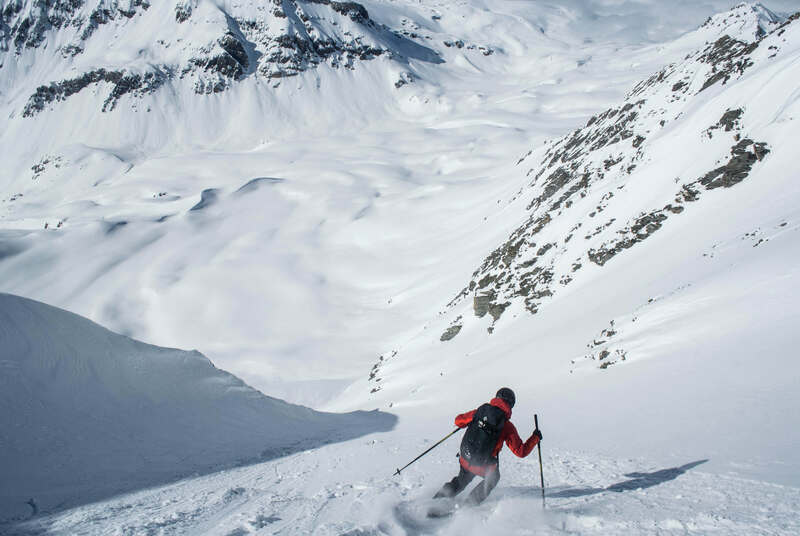 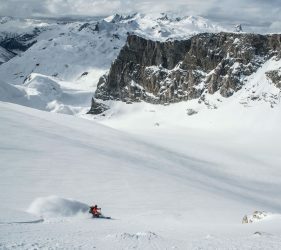 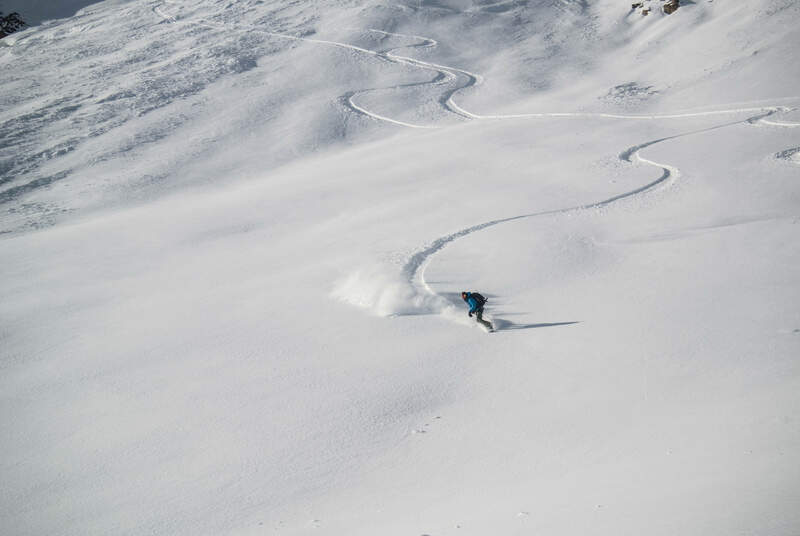 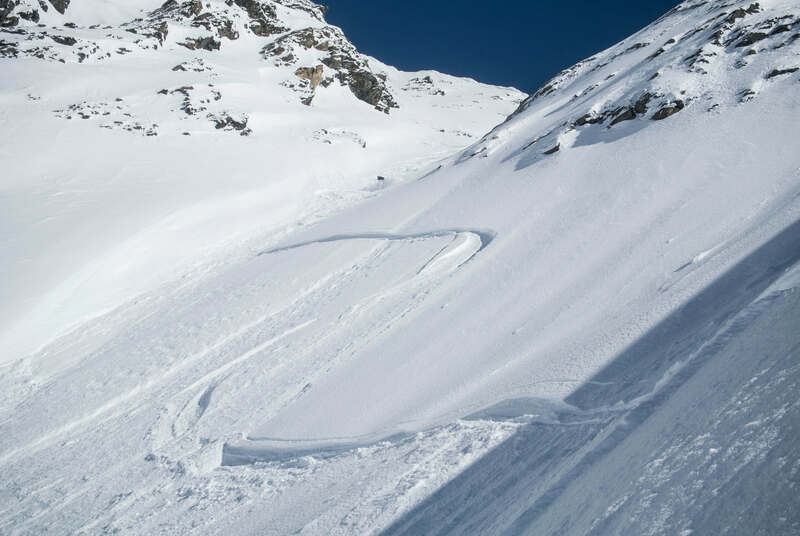 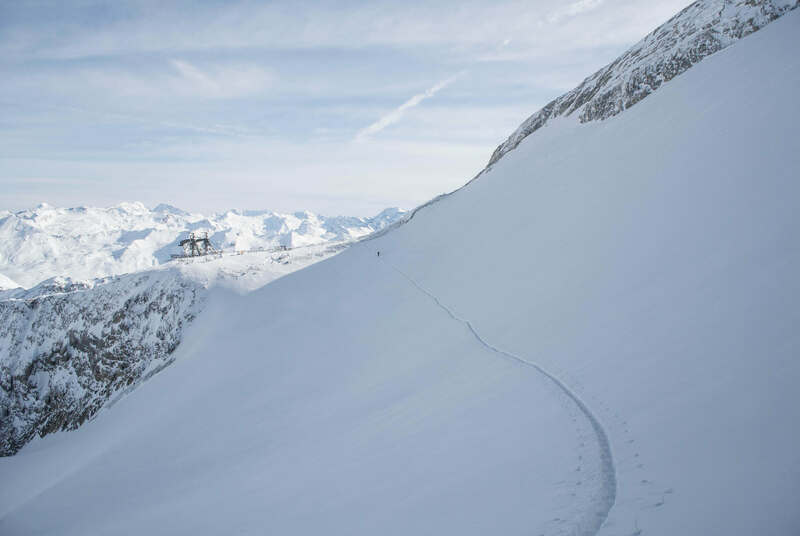 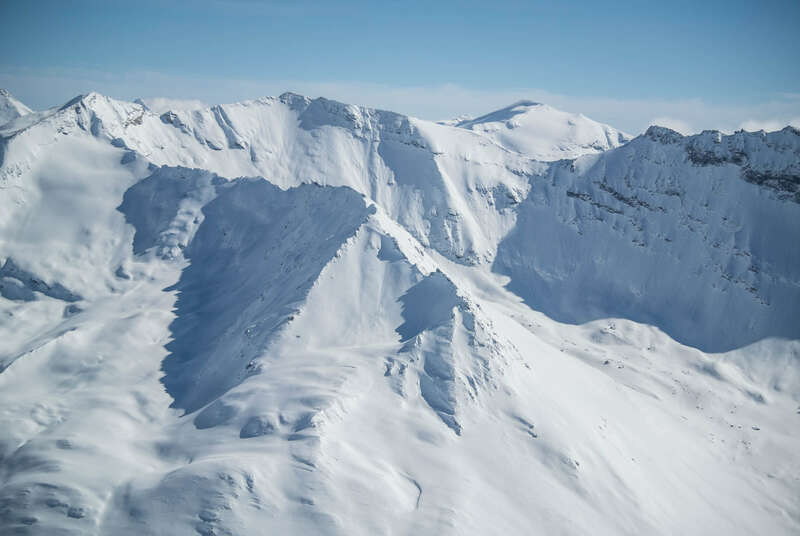 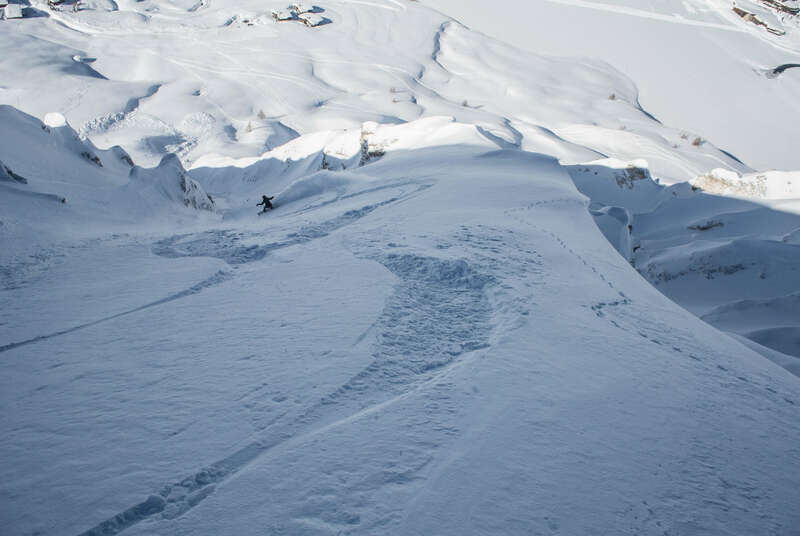 I’ve spent a lot of this week over in our Heliski drop zones in Italy (Valgrisenche and La Thuile), but the days that I have managed to ski back home in Tignes have given some amazing off-piste skiing conditions! 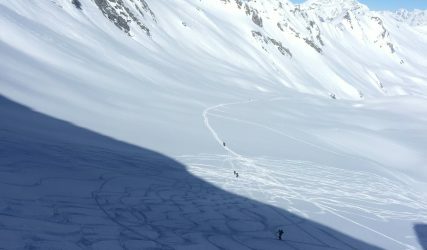 Avalanche conditions have settled quite a bit since our last ‘big’ snowfall (check the avalanche advisory), allowing us to get out and enjoy some steeper descents and start to tick of some of the bigger lines that are on my endless wishlist of ski descents 🙂 If you’ve been keeping up with my Journal then you’ll see that me and Holly had an interesting time on the South Face of the Grande Motte (5.3 E3) with some pretty firm conditions to be found in there. 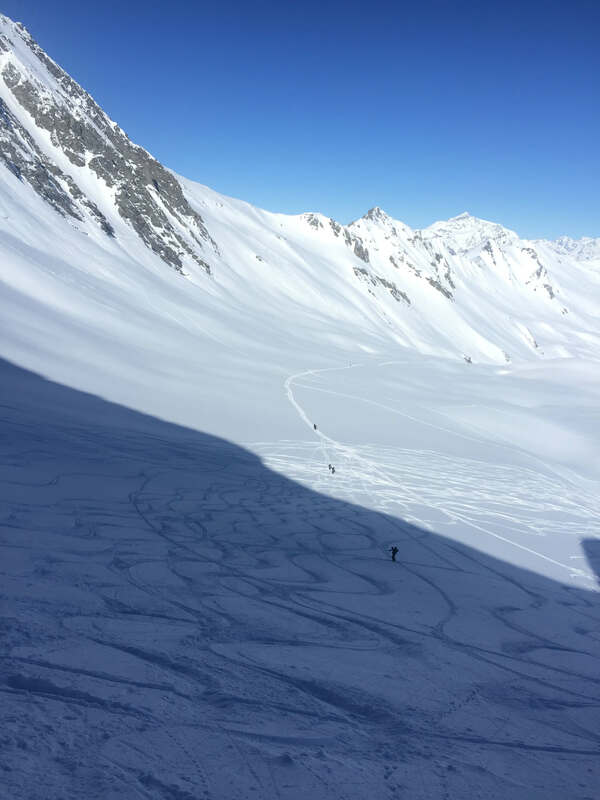 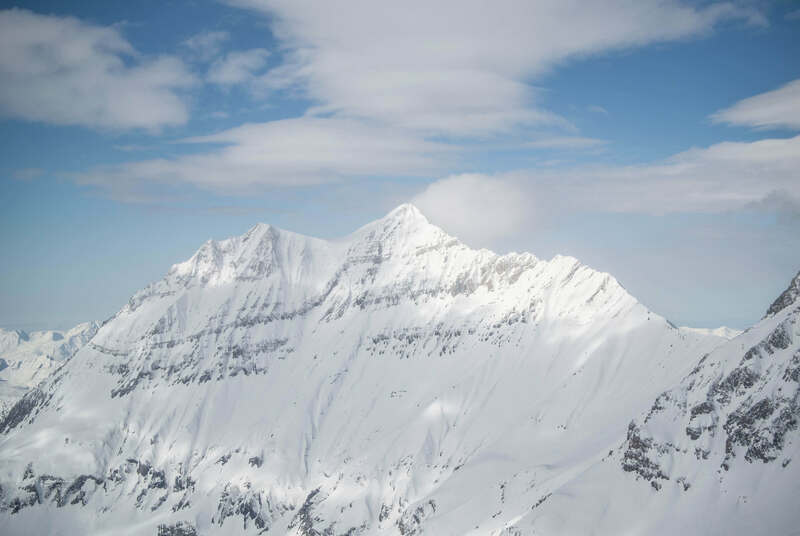 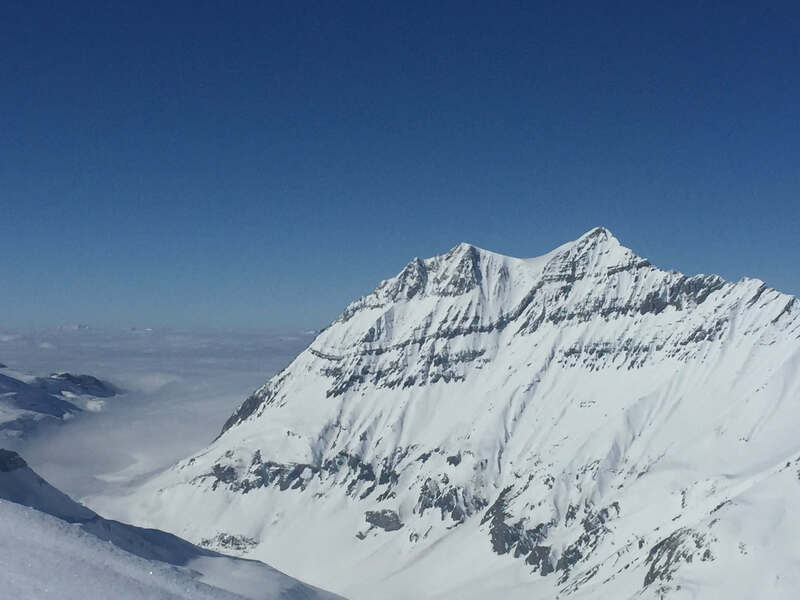 Friends of mine also skied the South Face of the Grande Sassière on Wednesday (31/01/18) but I was sadly on a Heliski trip, so couldn’t join them. 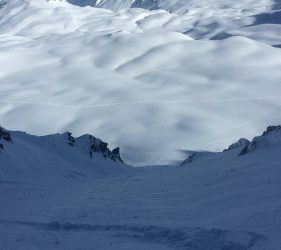 I’ve not really been doing too many resort accessible descents from the lifts, my focus has been on the bigger faces in the recent settled conditions, but I’ve heard that there are some amazing off-piste conditions in resort right now, with fresh snow still to be found not far from the lifts! 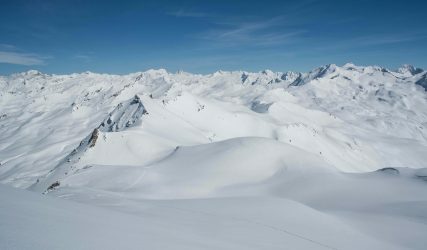 It looks slightly unsettled at the start of next week, with the chance of a dusting of snow early on in the week, but I don’t think it’ll come to much. 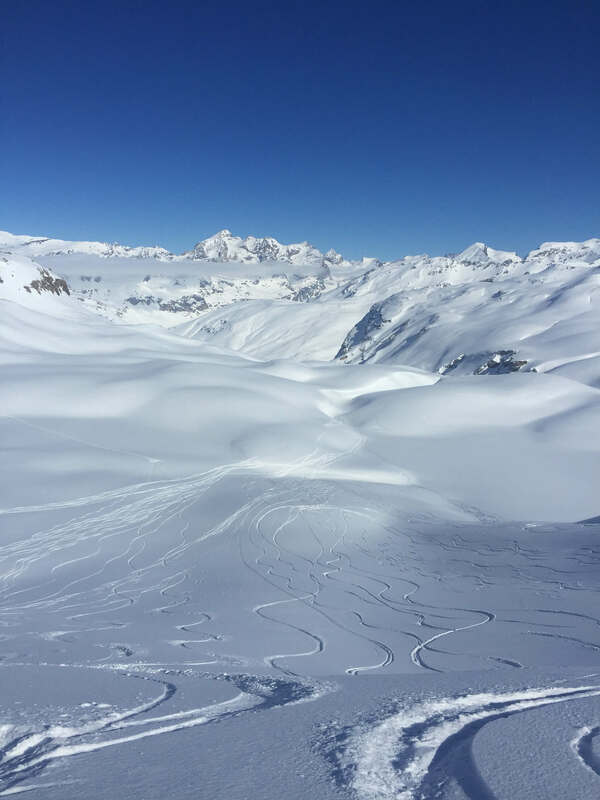 Things look to be settling down towards the middle/end of the week, with clear weather forecast again – enjoy! 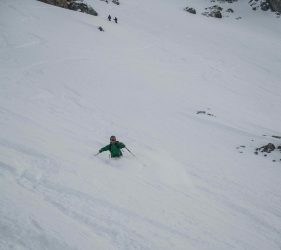 It was 3rd time lucky to ski this face for me, have been up twice before in spring 2 years ago to try and ski this face. 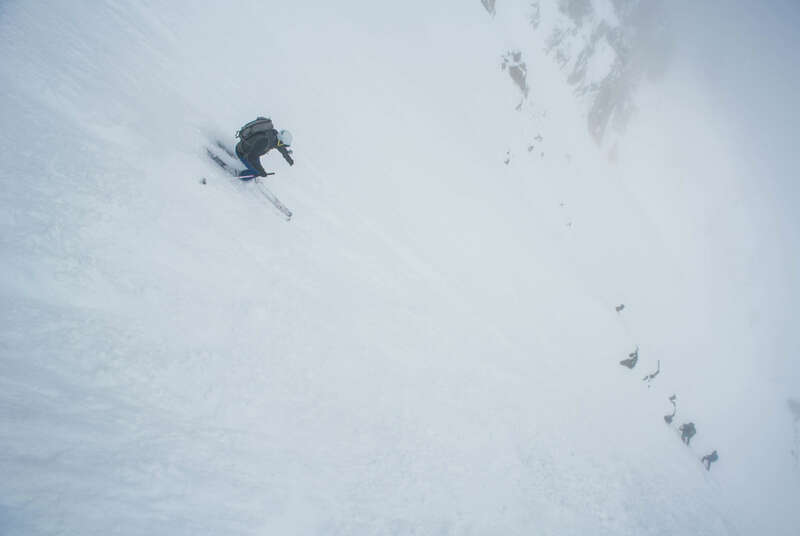 Both times before we were halted by tricky windslab perched at the top of the couloir. 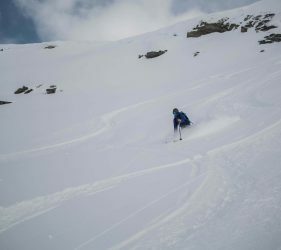 We were treated with much different snow conditions this year, with some brutal ice pretty much the whole way down, making things that little more interesting. 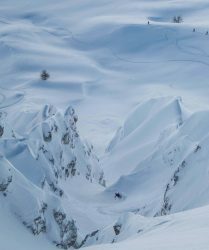 All in all, an amazing day skiing a super line in some fantastic surroundings! 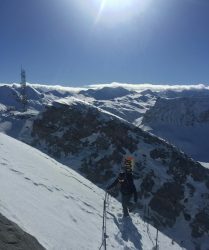 The Téléphérique de la Grande Motte was sadly shut (due to technical reasons or something) so we had an extra 400m of ascent for us in the morning. We quickly passed groups touring up to Couloir 3500 on our way up (we were initially worried about the snow warming up, but this would never be an issue given the frigid temperatures!). 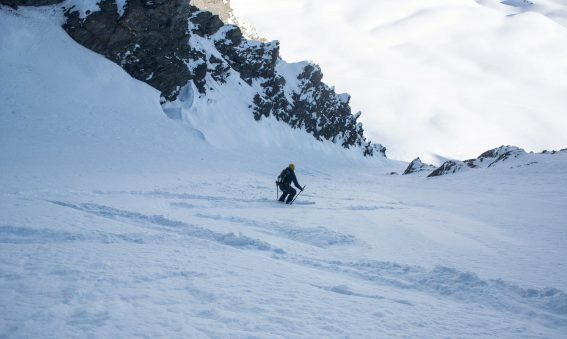 The snow conditions relented at times, giving some amazingly exposed turns in great scenery. 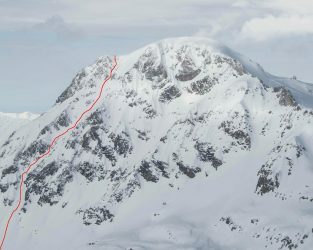 Skiing the ENE face of Pointe de la Sana has been high on my tick list for some time, having skied the East couloir and seeing the possibility for an entrance into this couloir from the exposed face above. 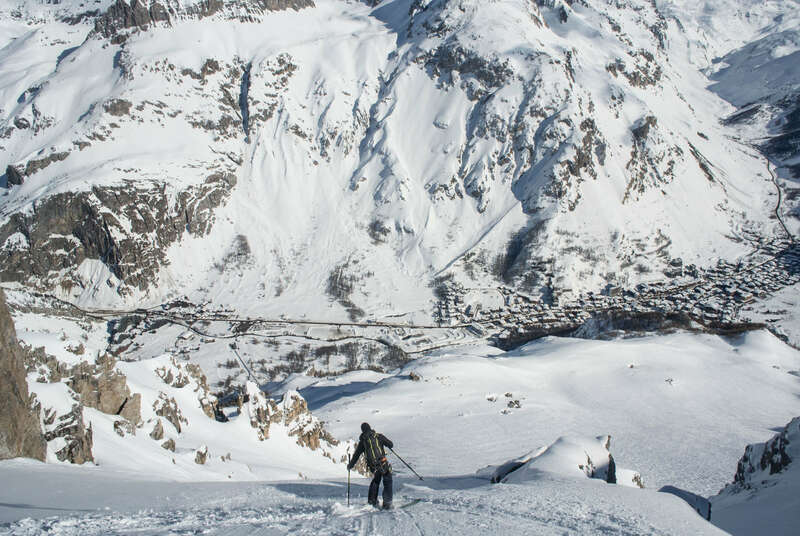 Me and Si left from the first lifts in Tignes to make it to the top of the Grand Prè chairlift to start our descent down into the Charvet Valley to begin the climb up to Pointe de la Sana (3436m). 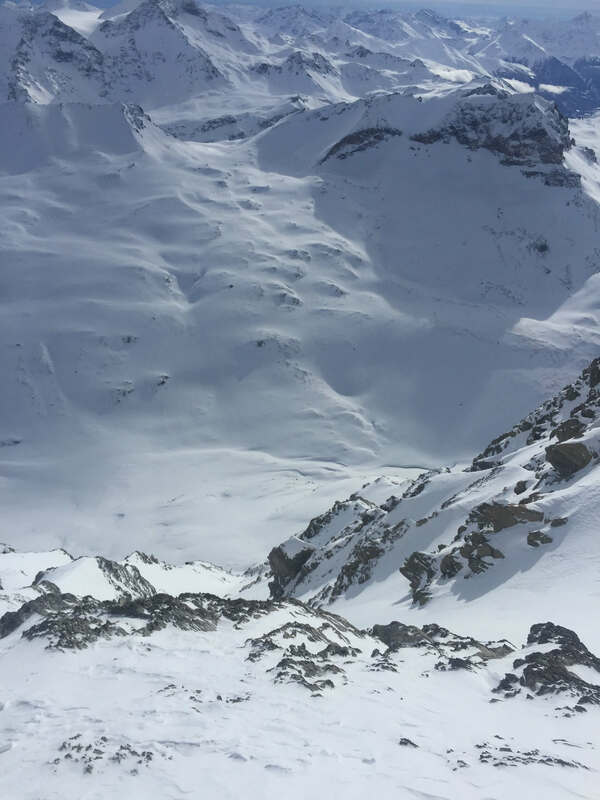 We were given some amazing views of the south faces of both the Grande Motte and the Grande Casse. 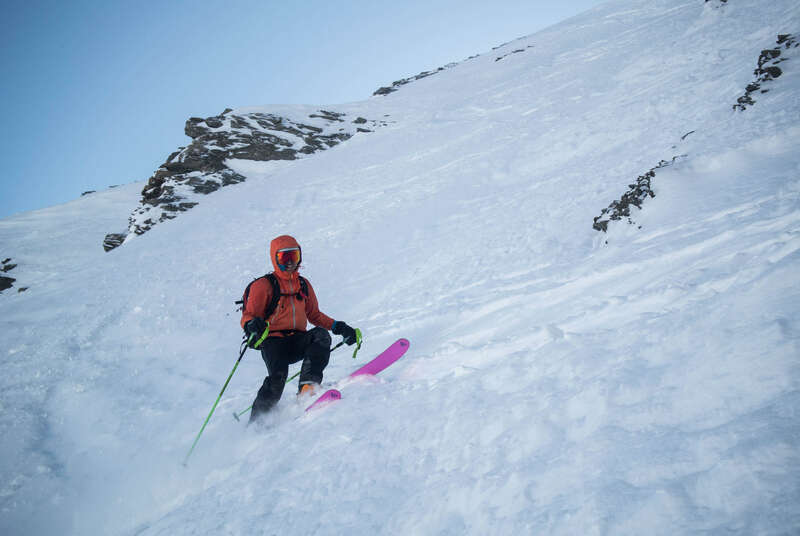 These faces both have descents I’d love to complete – they cross some amazing scenery! 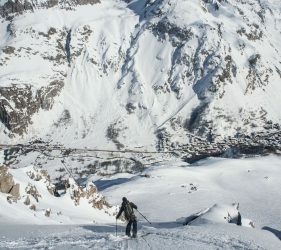 Me and Si have always liked the idea of skiing all of the Tignes Fingers (Les Tufs) that are listed on the Pisteur’s map. 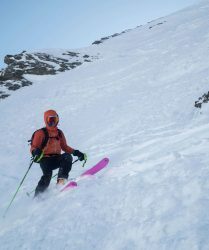 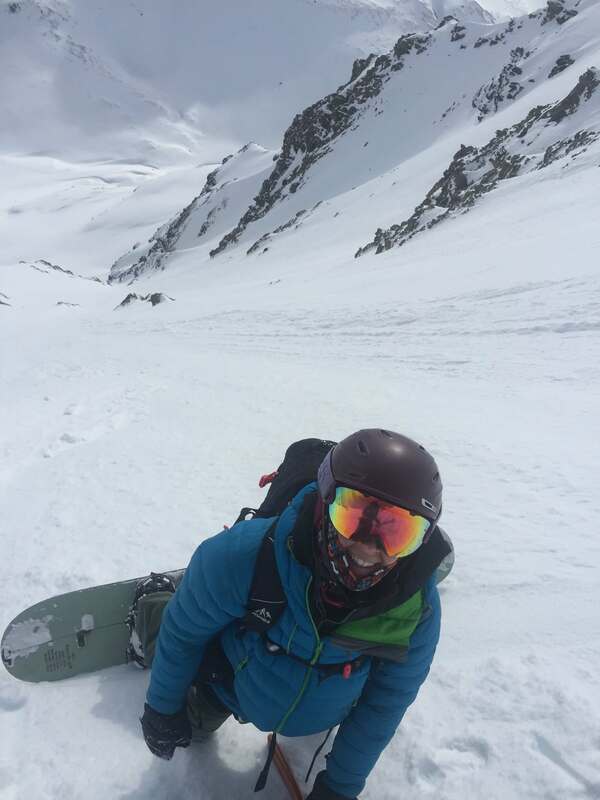 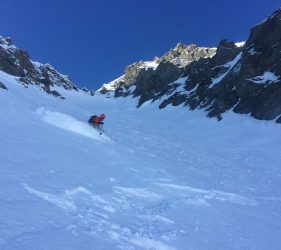 I’ve previously skied all the 4 ‘main’ lines down the face (the deepest couloirs, all located in the centre of the face) but had also wanted to explore all the more quirky lines down (such as #5.5). 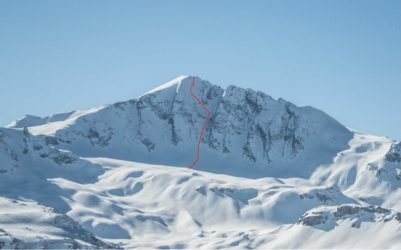 Although we skied all the lines listed on the Pisteur’s map, it’s gotta be said that these are not all the possible lines down this face, there are so many little variants and cross-overs that you can do to keep things interesting. 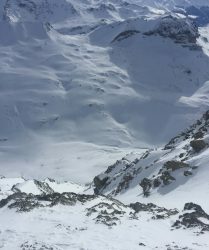 After a late start due to the lifts opening delayed, we started skiing some mini golf lines off from Palafour as soon a the lifts were spinning, allowing us to check out the snowpack and after doing a couple of laps we were happy with snow stability to head over to Tignes Finger #01 to open it up after a wee ski cut from the top.